NOTE: All shutters and barrels with mounting flanges unless noted. Lenscaps provided unless I cannot find caps in my 200+ inventory. All Copal shutters are synchronized. All come with a 10 day money back guarantee. 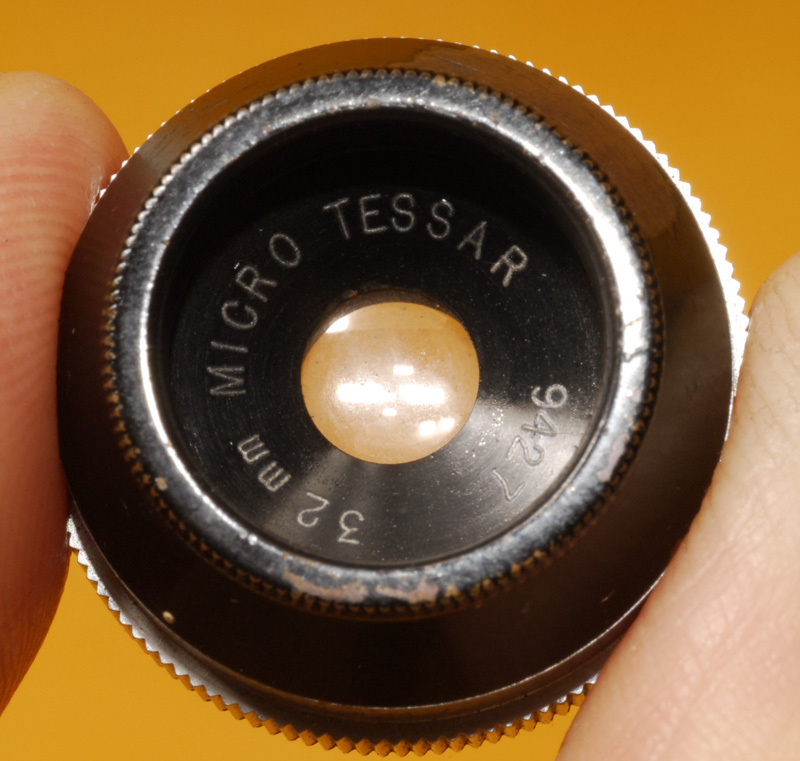 Some macro and micro lenses are listed here, but most are to be found on my copy camera list. Most enlarging lenses are to be found on one of my darkroom lists. All barrel mount lenses have diaphragms unless noted. If a lens is not listed as being coated or multicoated, then it is uncoated. Telephoto lenses are listed as such and require only about 3/5 the focal length to focus at infinity, but they do not have as wide an image circle as normal lenses. Portrait lenses are individual; each is described. 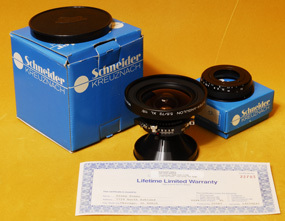 Some shutters, lens mounts, lens cases and some other lens accessories are listed among the lenses. 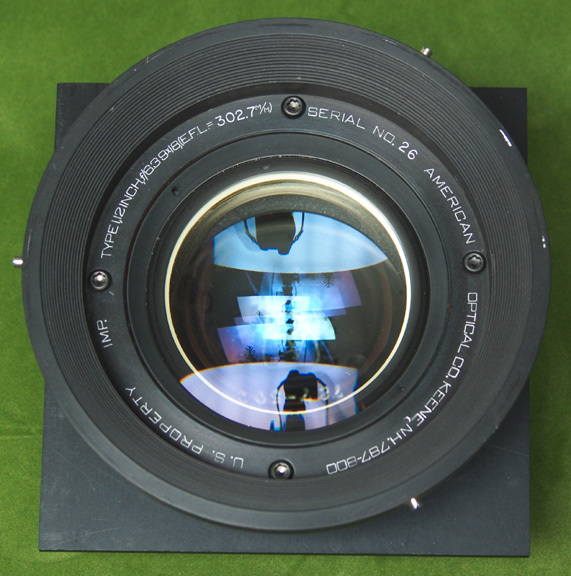 I have many lensboards in stock and will gladly sell you a lensboard and mount the lens for you. Books about lenses are found on my book web page. 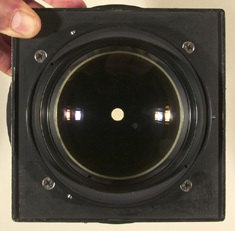 Shutters and lens flanges are found on my view camera lens shutters web page. 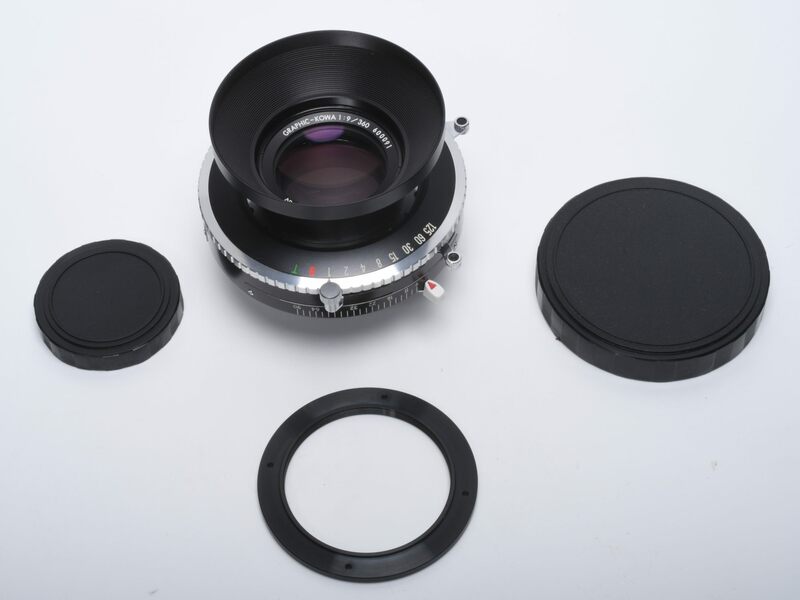 24mm, 25mm, 35mm, 42mm Leitz Summar lenses, 50mm Leitz Milar lens, related Leitz Aristophot equipment, Linhof Luminar adapters, RMS mount adapters, Leica screw mount adapters, and lots more related equipment on my Copy Cameras web page. 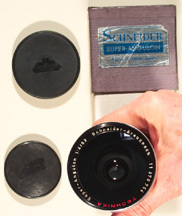 40mm F4 Schneider Componon, coated, in barrel w/o diaphragm or mounting flange. 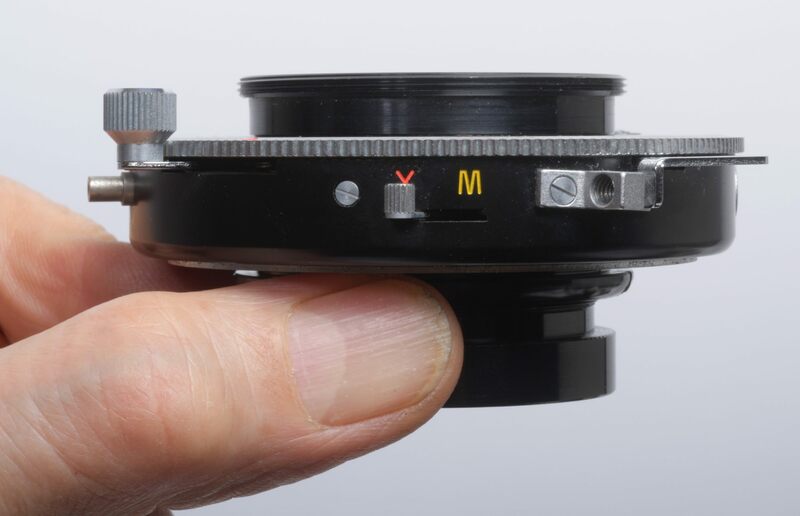 Lens has groove around waist. 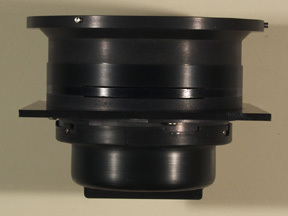 Easiest way to mount it is with a universal diaphram lensholder. Macro lens. Ex+, $40. 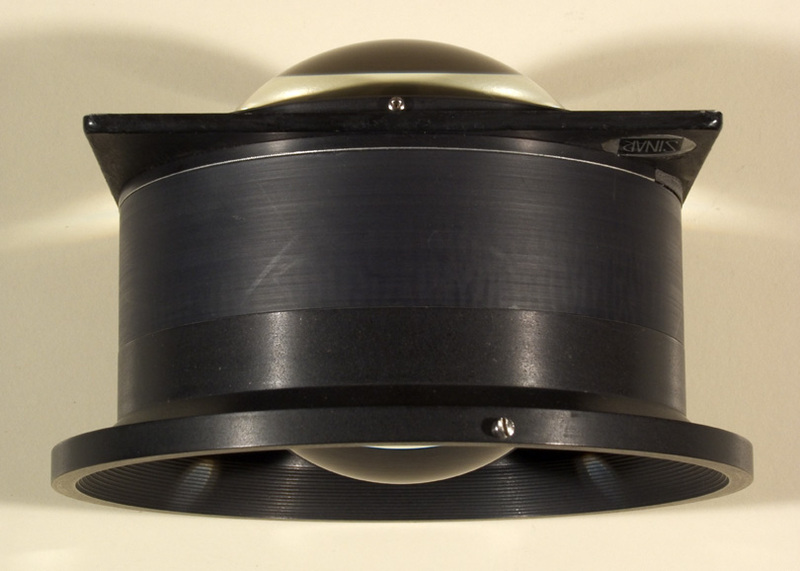 Universal diaphragm lensholders are to be found on my VIEW CAMERA LENS ACCESSORIES page. 53mm F4 Technika Super Angulon lens, coated, Linhof Compur #0 shutter, for 6X9cm, designed to be a direct competitor to the 53mm F4.5 Zeiss Biogon, performs at least as well in my opinion, rare, boxed, Mint, $1000. This lens was sold. 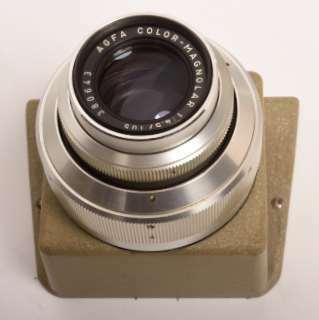 I have another, not in the box, but with a Sinar Handy type camera. I am willing to sell that lens without the camera for $500. 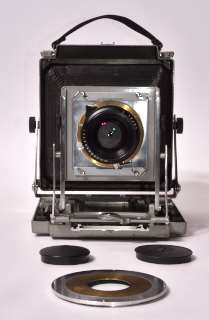 See my SINAR CAMERAS web page for that camera and lens. 72mm F6.3 Wollensak Raptar, coated, barrel, fixed aperture, built-in mounting ring. 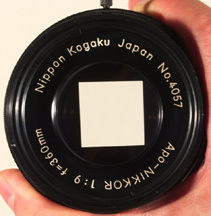 This was probably designed as a flat field macro copy or projection lens. It does a great job of magnifying the pixels on my computer monitor. Pretty clean glass. It may cover some larger formats at higher magnifications; 35mm is a safe bet at just about any magnification. $20. 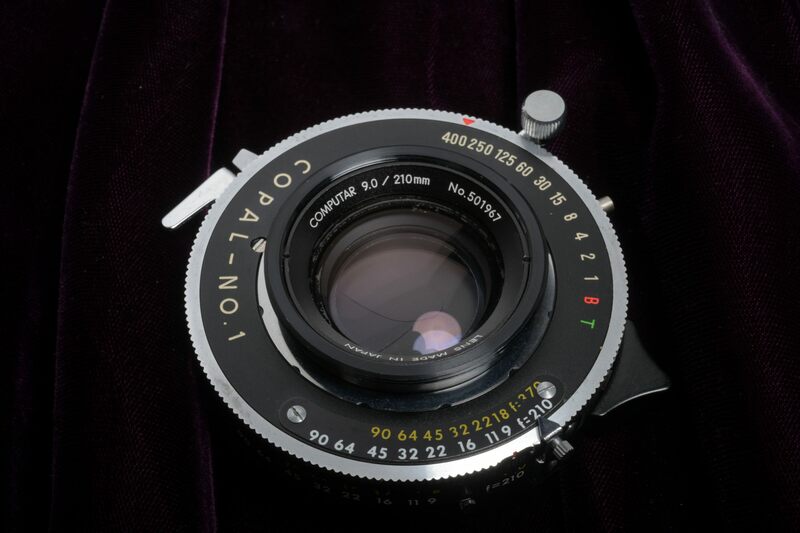 75mm F4.5 Tominon: see my Copy Cameras web page. 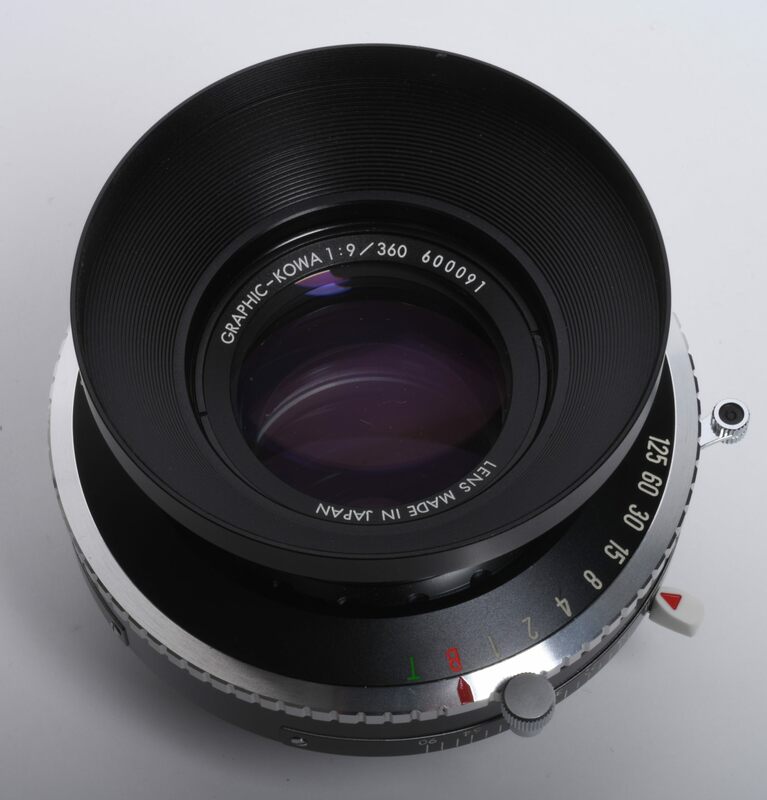 75mm F8 Fujinon SW, coated, Copal, 106 degree coverage wideangle lens, Mint, $500. 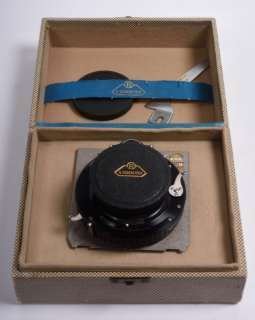 Plaubel Peco Jr. lensboard not included, but available separately. 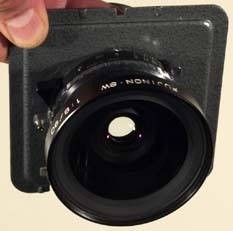 75mm F48 Goerz Hypergon. This lens has been sold, but while I had it I photographed it for your enlightenment. Additional photos and info about Hypergons. 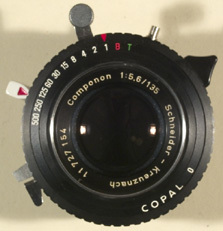 90mm F5.6 Super Angulon XL, 110 degrees coverage, multicoated, Synchro Copal #0. Mint $800. 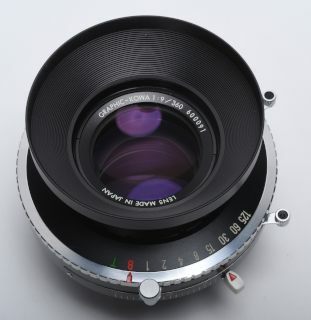 90mm F8 Fujinon SW, multicoated, 106 degree coverage wideangle lens, Mint, $500. Plaubel Peco Jr. lensboard not included, but available separately. 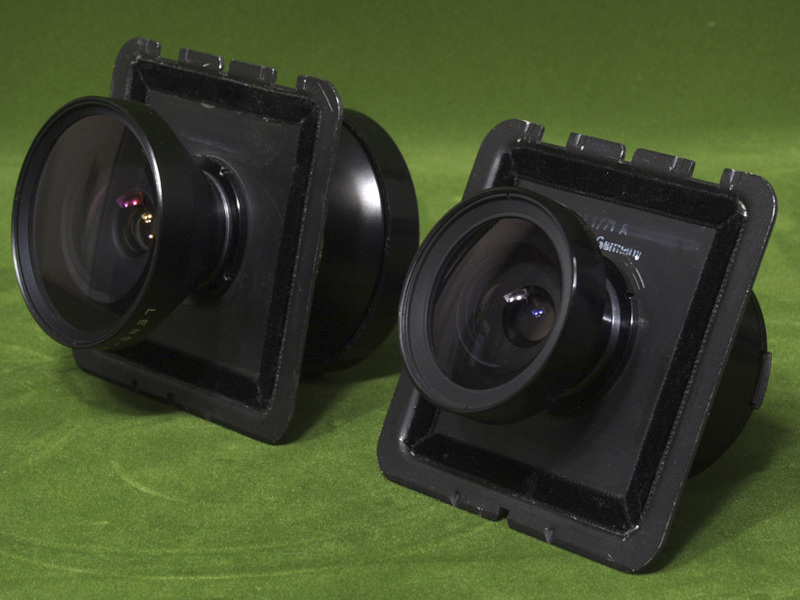 These lenses are very well mounted on these lensboards. New felt strips replaced the original foam that had deteriorated. 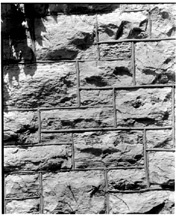 View of rear shows 90mm Fuji on left, 75mm Fuji on right. 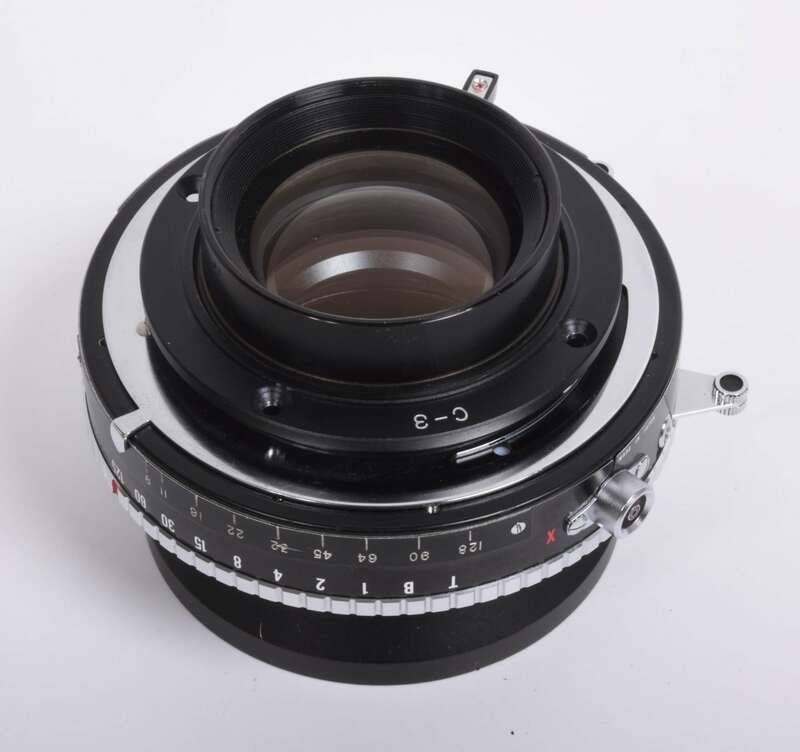 105mm F8 Fujinon SW, multicoated, Copal 0, covers an 11" image circle, covers 4X10", perfect glass, marks but no dents on barrel, hard to find lens, $700. 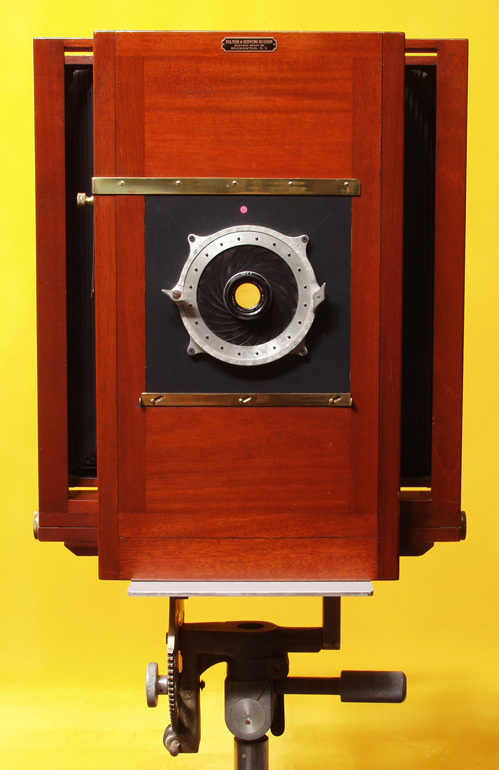 The 8X10" Kodak Master view camera is a perfect choice for wide angle lens usage as short as 47mm. You will find the Kodak Master view camera on my View Camera web page. 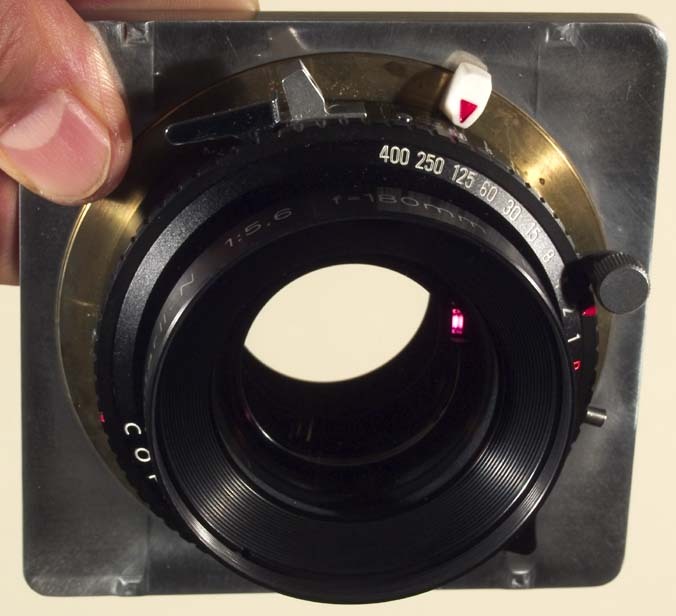 Add $80 for lens neatly mounted on a Sinar lens board. 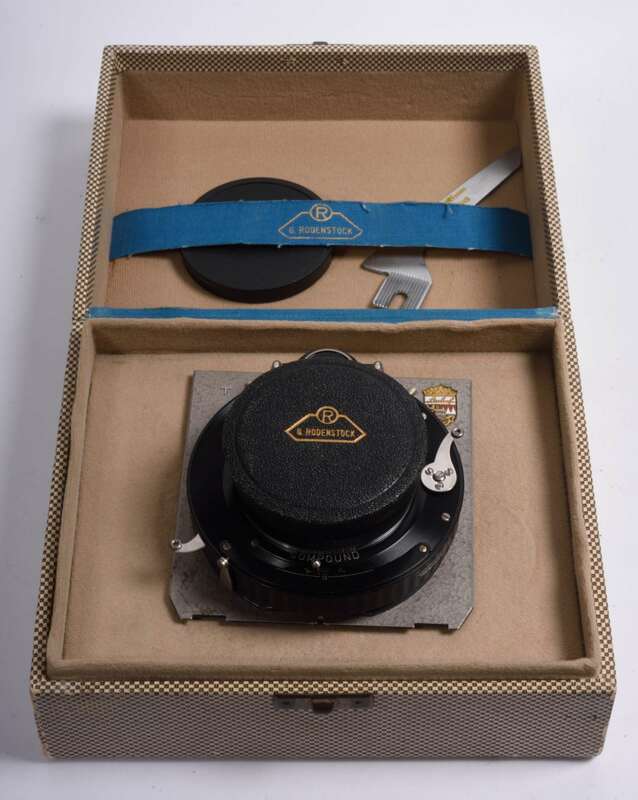 Yes, this Kodak Master view camera accepts Sinar lens boards. 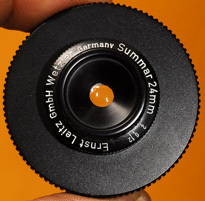 77mm filter size. With both original lenscaps. 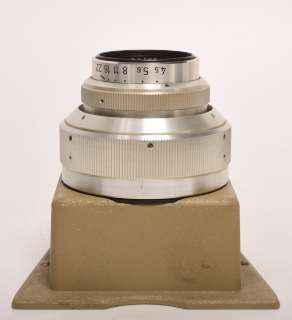 127mm F4.5 Tominon: see my Copy Cameras web page. 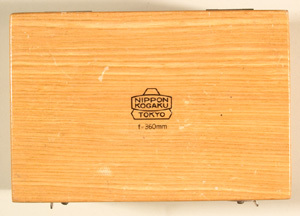 135mm F4.5 Tominon: see my Copy Cameras web page. 135mm f5.6 Componon, coated, Synchro Copal, flat field macro lens also good for infinity use, Mint, $300 Note: Check out Ken Kay's article on why he uses Componons for studio photography in "The Photography Catalog," designed after the "The Whole Earth Catalog," but devoted to the subject of photography. 150mm F9 G-Claron, coated, Compur 0, will cover 5X7, click stops at half stop intervals, shutter is sticky at slow speeds, otherwise Mint, $200. Note: I will have it cleaned, lubed and adjusted soon. Price after cleaning, lubing and adjusting is $450. 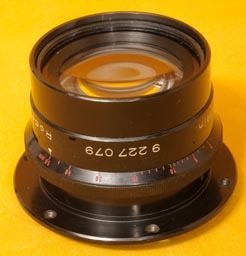 150mm F9 G-Claron, coated, barrel, will cover 5X7, Mint-, $100. You may wonder how I test lenses to determine coverage. 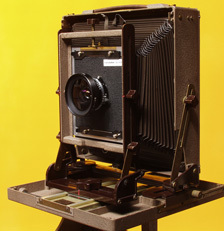 I use a larger format camera than the lens was intended to cover. I have several cameras set up to accept lenses with little effort. 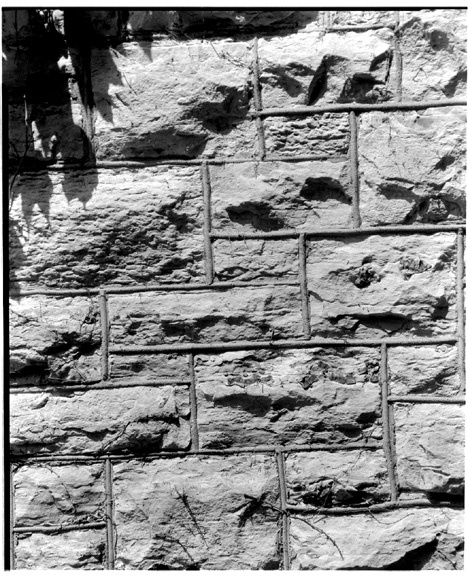 In this case, I used an 11X14 F&S. The clear circles on the camera back allow me to see the lens diaphragm and to focus on the aerial image--which is much brighter and sharper than the ground glass image. The 11X14 F&S easily allows me to focus with a lens as short as and even shorter than this 158mm. The 11X14 F&S is mounted on a Saltzman Studio Stand. Note that the large tripod top plate supports the hinged joint in the fold down rail. The 11X14 F&S is listed on my View Camera web page and the Saltzman Studio Stand is listed on my Tripod and view camera accessories web page. Also note the universal diaphragm lensholder that allows me to quickly mount lenses; universal diaphragm lensholders are listed on my Tripod and view camera accessories web page. When I have larger cameras in stock, I will test lenses with more coverage on larger cameras. 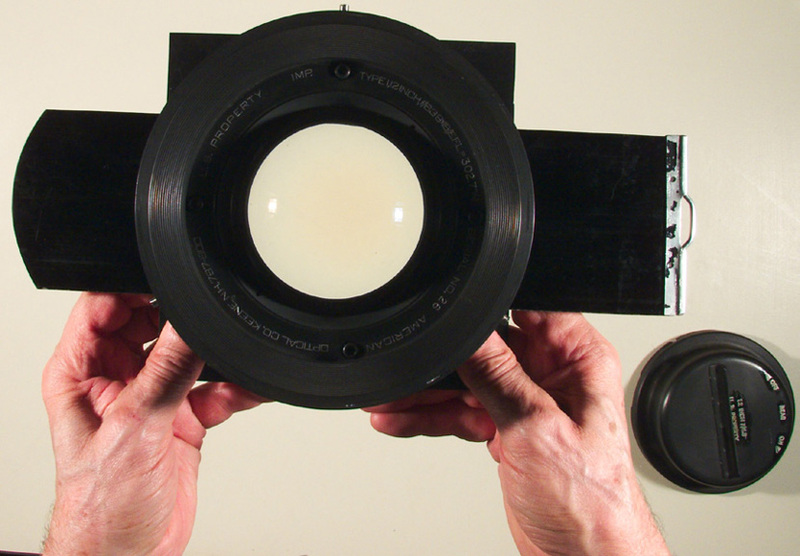 I have an 8X20 Sinar that I also use to test lenses. 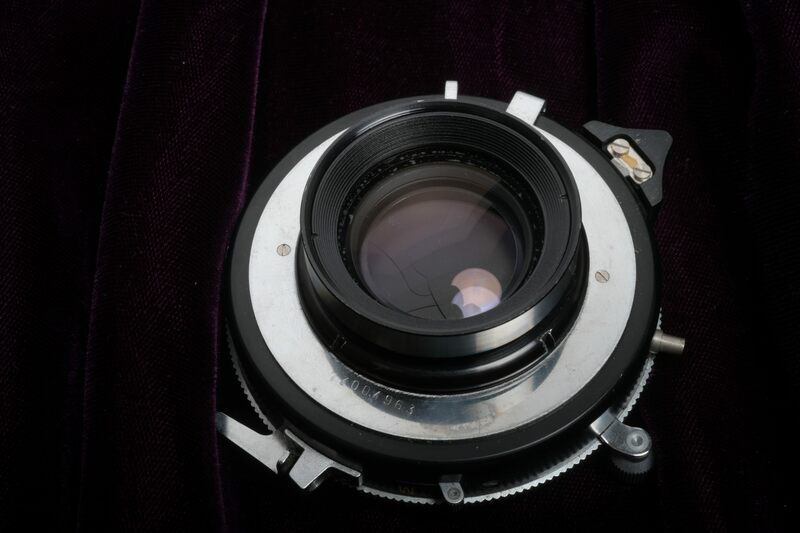 And presently I have a 12X20 Sinar camera in stock, so I used it to test the ~300mm ~F8 lens listed below. 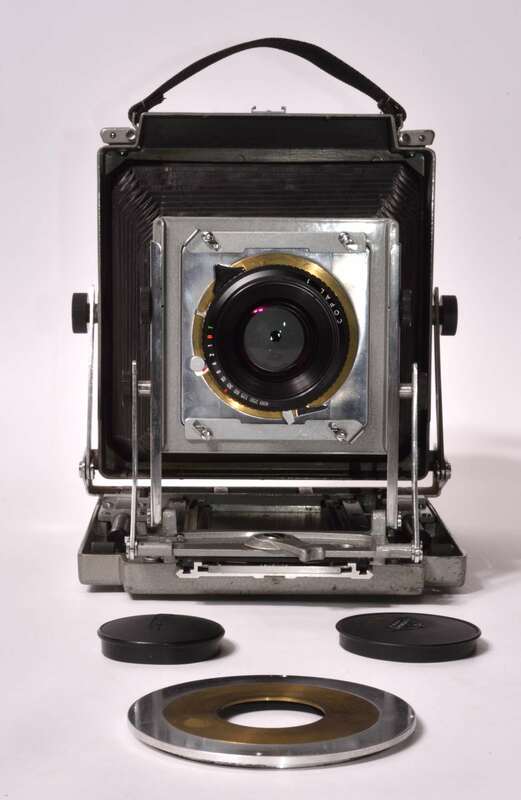 See my Sinar page to see these cameras. 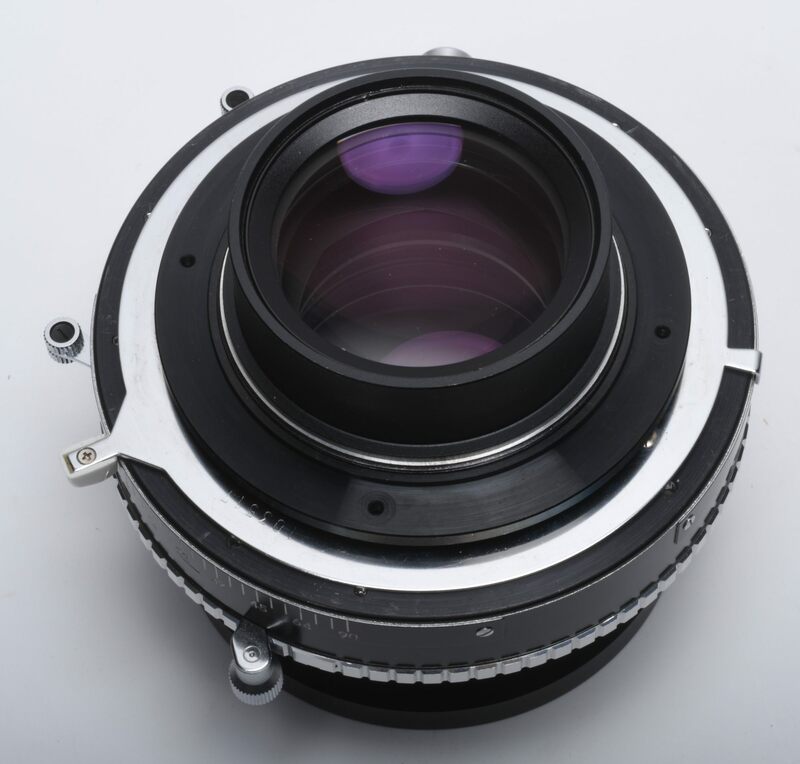 165mm F9 Computar, coated, in barrel with filter slot. 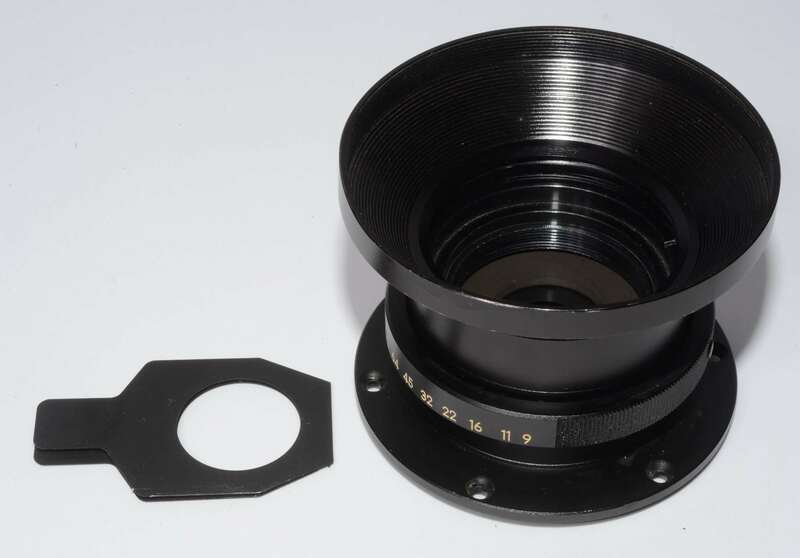 This is a 210mm F9 Computar front element and barrel with a 150mm F9 Computar rear element. 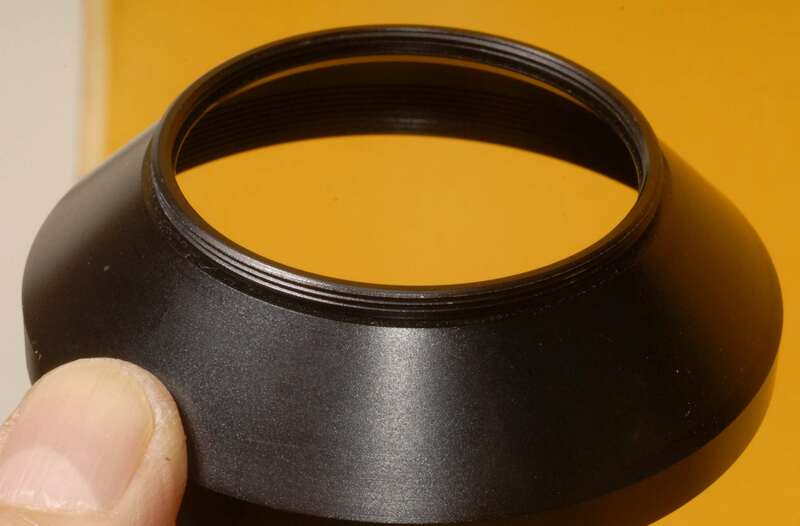 There is 1mm separation around the perimeter of the rear element; this will not affect the lens' performance because you will be using this lens stopped down for coverage. 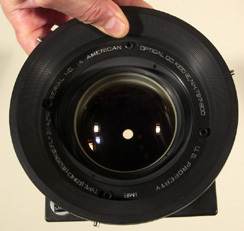 The diaphragm stops down to F90; diaphragm will give a little overexposure for this 165mm focal length. 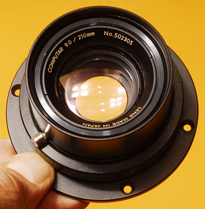 This lens has the same high quality definition as provided by a factory original Computar. 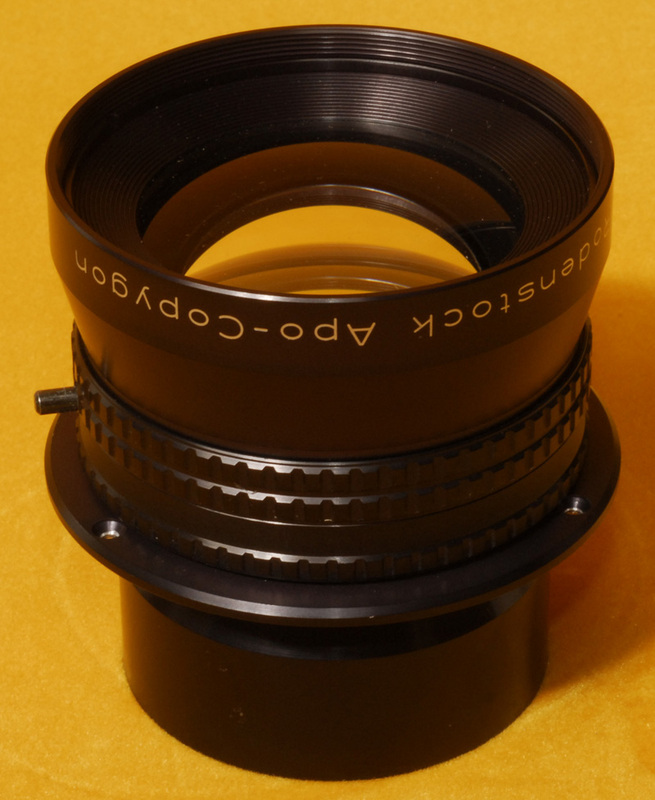 It covers 8X10 and will outperform a 165mm (6 1/2") Wide Angle Golden Dagor. Clean glass. $OLD. 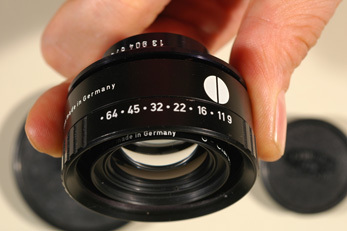 This lens and the next lens are separated from the other lenses because they are both similar. You may want to buy both lenses. If you bought both lenses, you could combine the 2 front elements into one 210mm lens and the 2 rear elements into one 150mm lens. 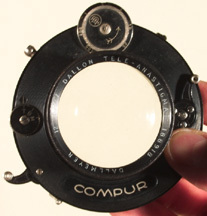 The Computar lenses are only similar to the Dagor. 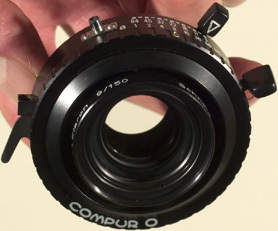 The Dagor is a symmetrical lens; the Computar is not symmetrical. 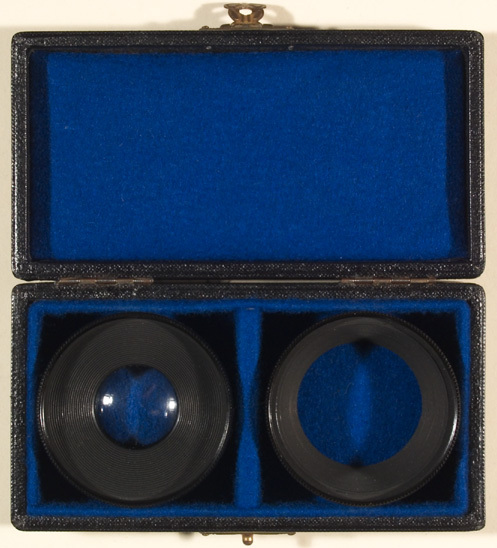 By combining the 2 front elements and the 2 rear elements from these 2 lenses, you would have 2 symmetrical lenses that would be even more similar to a Dagor. My guess is that the two 210mm front elements will cover at least as much, be at least as fast and perform at least as well as the factory designed 210mm Computar. I may do this myself--except that I have 2 factory original 210mm Computars and I have far more projects lined up than I have time to complete. These 2 165mm lenses $OLD. 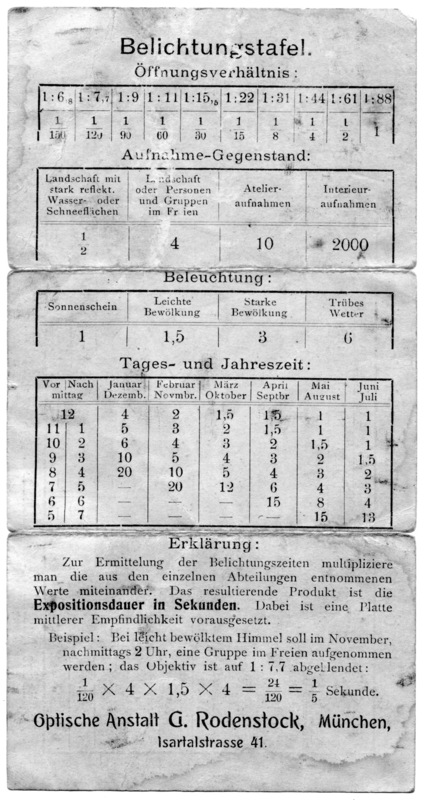 I leave this information up for your information. I do not want to see anyone taken advantage of by someone selling you a 165mm lens as a 210mm lens. I was not hurt because the 165mm lenses have value themselves. 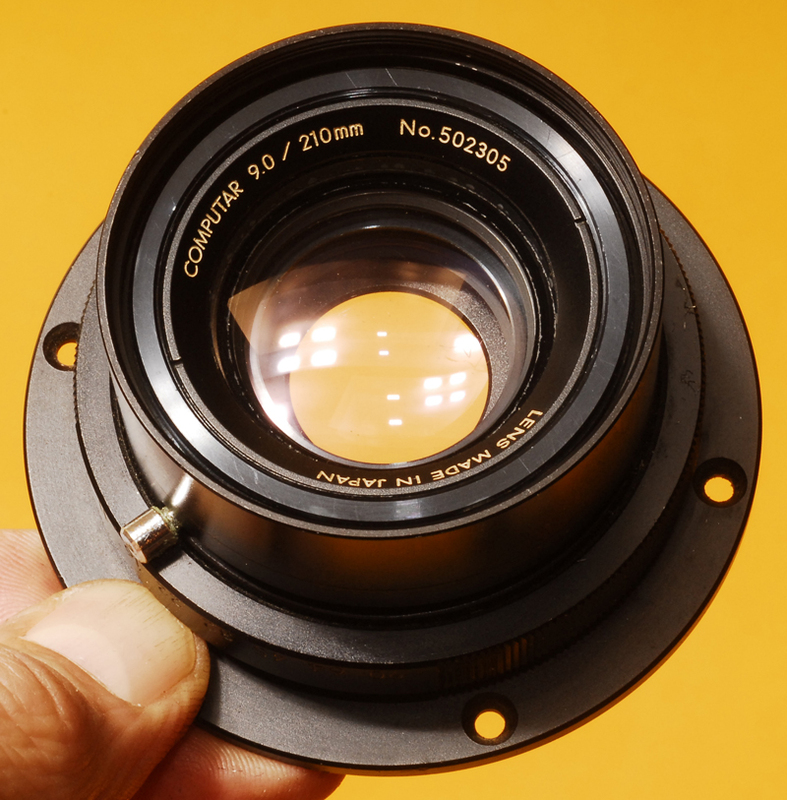 165mm F9 Computar, coated, in barrel with filter slot. This is a 210mm F9 Computar front element and barrel with a 150mm F9 Computar rear element. There are some extremely slight cleaning scratches on the both the front and the rear lens groups. The diaphragm stops down to F90; diaphragm will probably give a little overexposure for this 165mm focal length. This lens covers 8X10 and will outperform a 165mm (6 1/2") Wide Angle Golden Dagor. 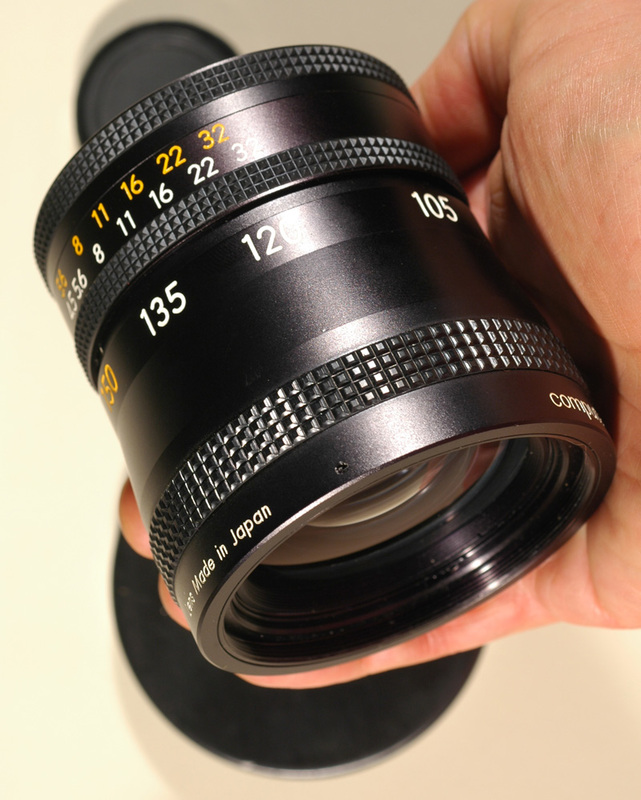 $OLD Note: It is not all that unusual to find these lenses in this configuration. The 210mm Computar is a highly sought afer lens; crooks will take advantage of such a market. The 1st one I bought from a camera dealer who took short term advantage of my trust to sell me one of these lenses as a 210mm lens. His trick was short sighted because I later found out the truth and now I know better than to trust him. The other lens I bought off of Ebay; the seller sent me a partial refund when I told him about the situation. 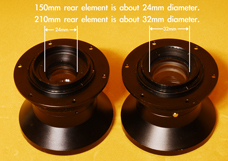 The rear elements of 150mm and 210mm Computar lenses are interchangable. The rear elements are oftentimes damaged. 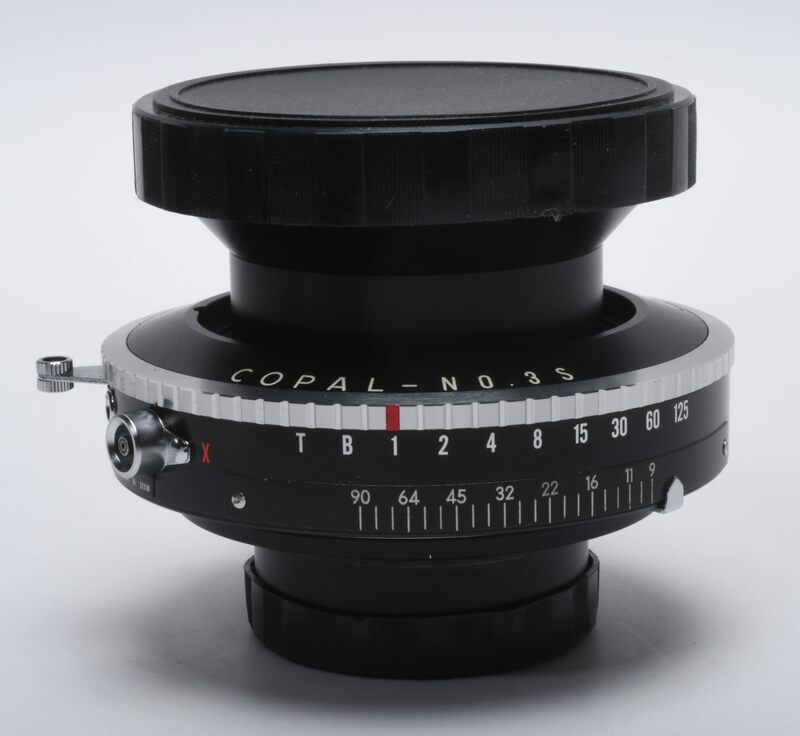 Here is what to look for: The diameter of the rear element glass differs between the 150mm Computar and the 210mm Computar. 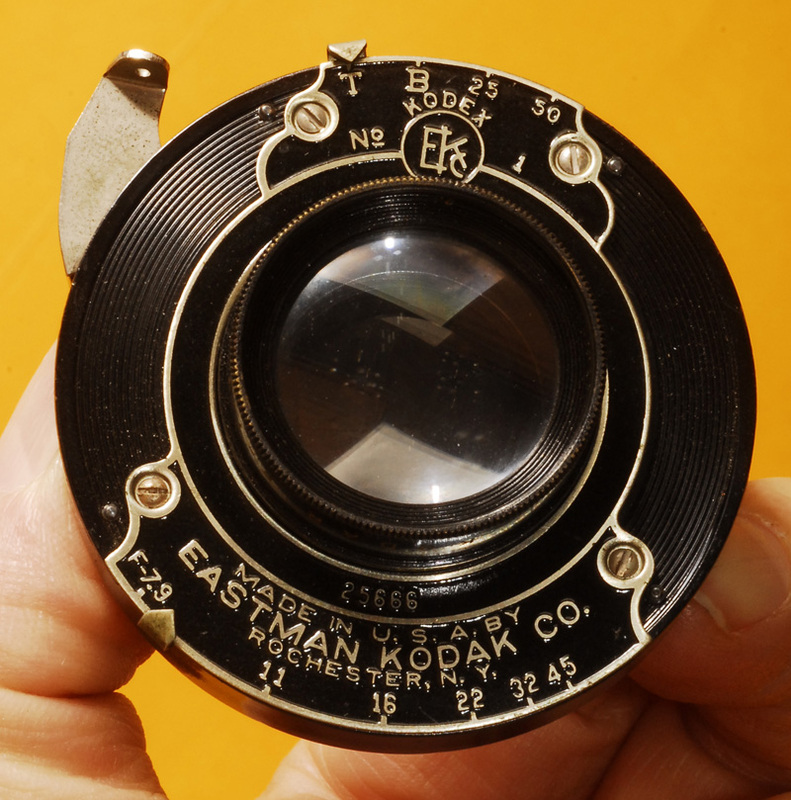 173mm F7.9 Kodak lens, uncoated--except for some naturally acquired coating, Eastman Kodak #1 Kodex shutter. This lens is probably off of a folding camera of about 4X5" in size. Shutter works. Some bubbles in glass. Glass is clean. With jamb nut. With cable release socket. 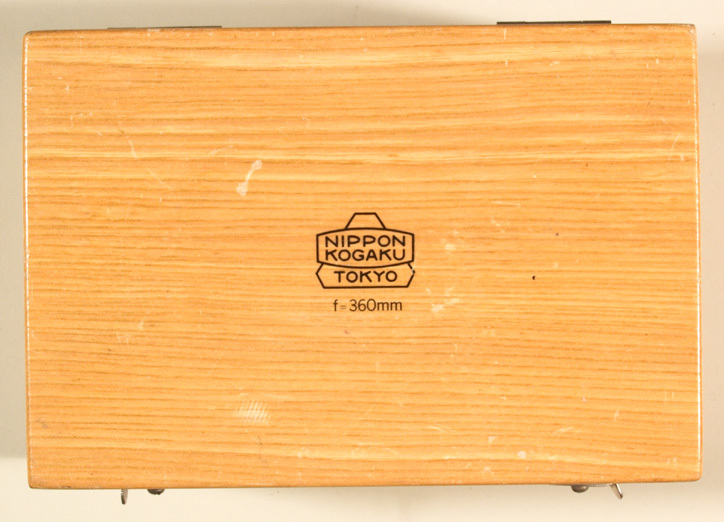 Do not buy this to produce commercial quality images; buy it to refurbish your old camera. $20. 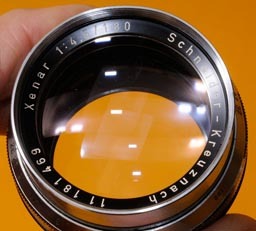 180mm F4.5 Xenar, coated, barrel with diaphragm. Beautiful glass. Chrome plated brass barrel. Many bladed diaphragm. No flange. $120. This came in along with a 210mm Xenar lens and a Beattie Portronic camera. I have parts for this camera on my VIEW CAMERAS web page. Those parts are at no charge if purchased along with both Xenars. 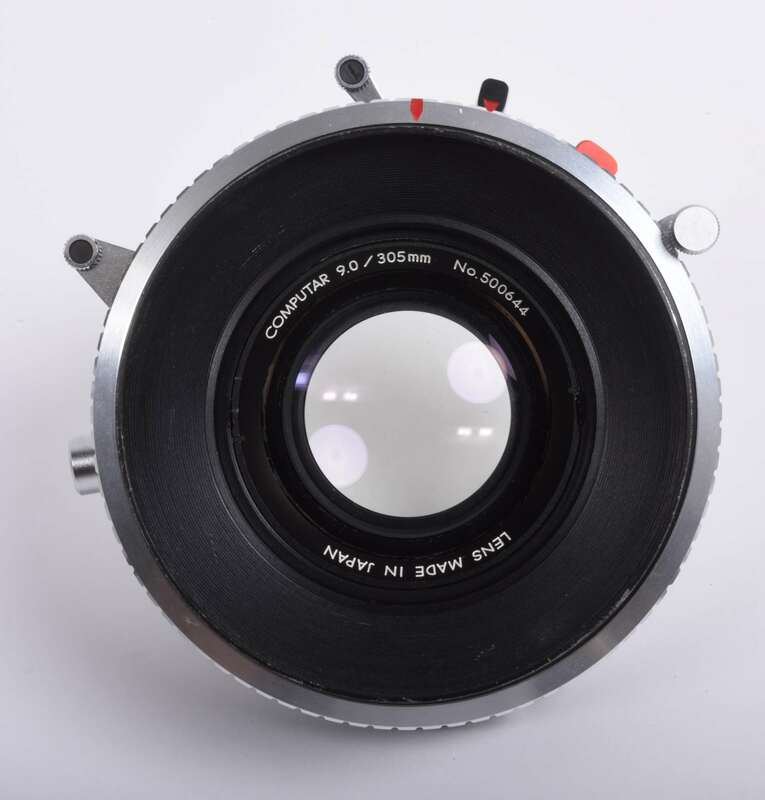 180mm F5.6 Caltar II N (Rodenstock Sironar), multicoated, Copal #1, Mint, $350. The lens is mounted on a round brass lensboard that bayonets into 2 different lensboards. 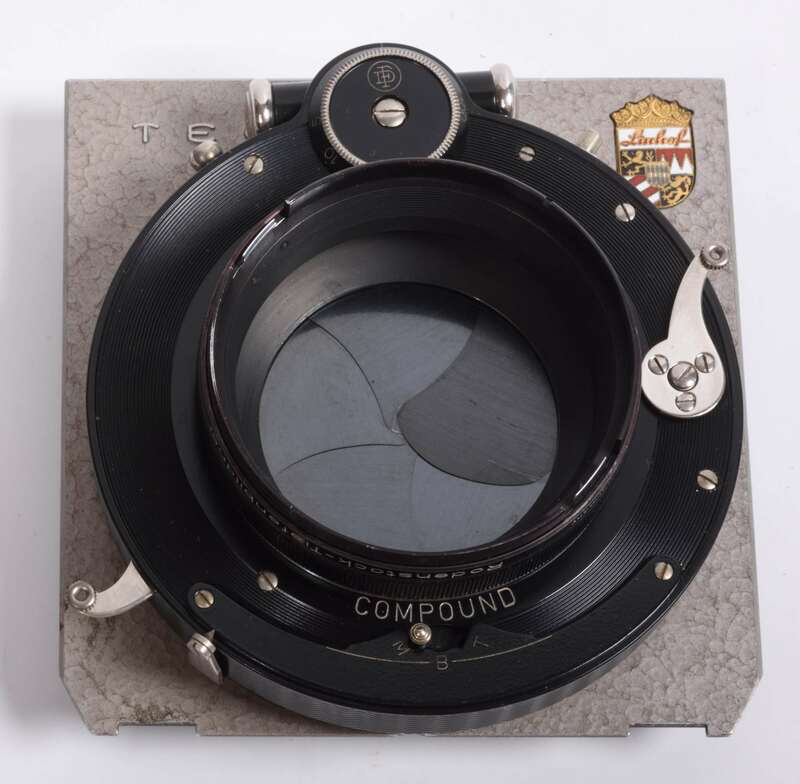 One lensboard fits a 5X7 Toyo Field or a Crown or Speed Grafic. The 2nd lensboard is with a 4.375" mounting ring that will fit the view camera lensboard of your choice. 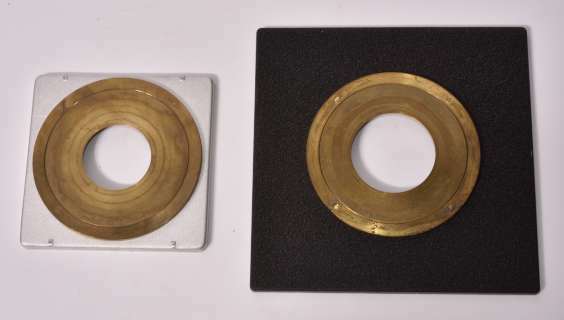 Both brass lensboards are for #1 shutters. See more details about this lensboard system on my VIEW CAMERA LENS ACCESSORIES web page. 200mm H5.8 Rodenstock Imagon, coated, Compound shutter with PC X-Synch for strobe. 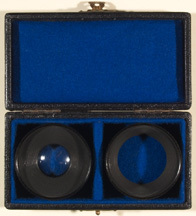 Complete set of 3 diffusion disks. Front and rear caps. 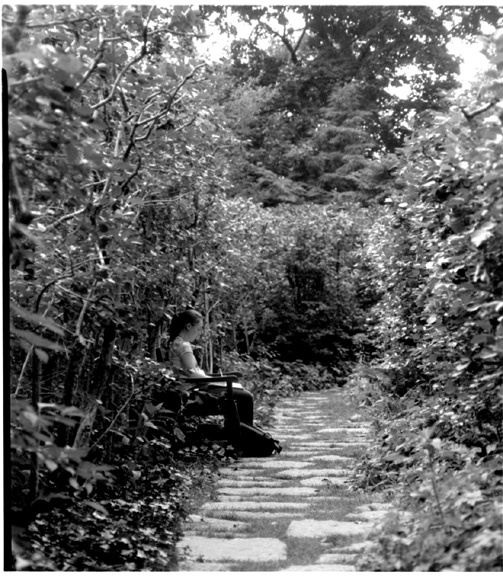 Speeds 1 second to 1/100 second, Time and Bulb. Clean glass. Shutter is working very smoothly. Multi-bladed diaphragm. 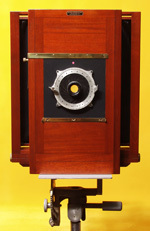 Properly mounted on Linhof Technika IV/V/VI tan board, with cam made by Linhof for 200mm Imagon. This is RARE. When my good friend had Linhof make a cam for his Imagon lens they said it was the only one they had made. I doubt very much that you will find another. The serial number does not match because Linhof took a VI 210mm lens cam and recut it for the 200mm Imagon and over stamped the 210 with 200 and painted it appropriately. I have tested the lens on a Technika. The focus is accurate. 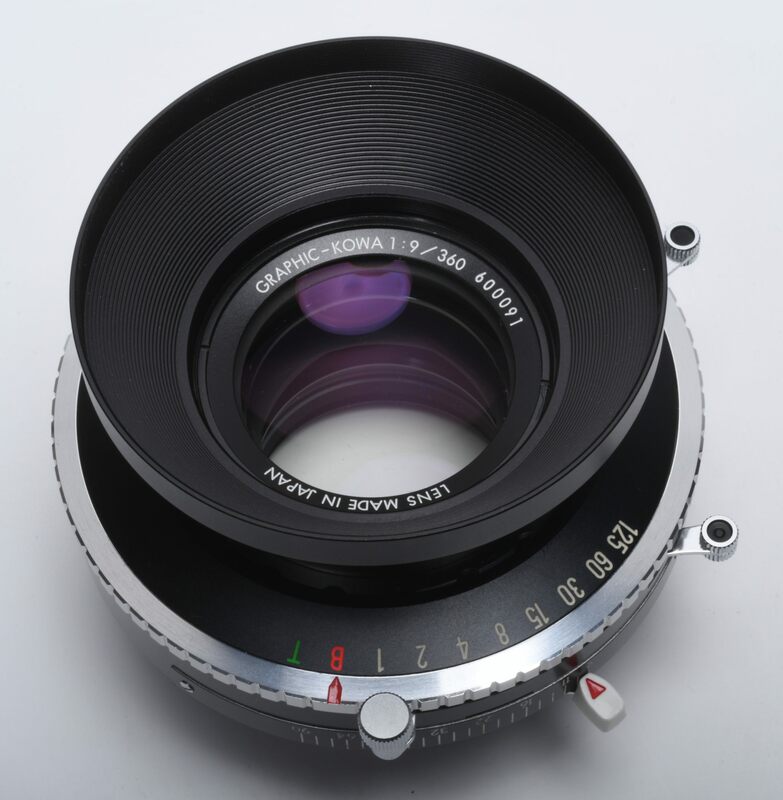 The reason no one had ever before had an Imagon lens cammed to a Technika is that one is expected to use the lens visually. In actuality, once you are familiar with using an Imagon, you know what degree of softness you want. 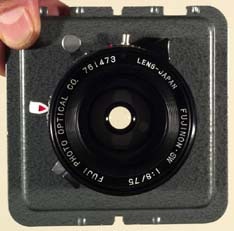 The cam focuses the sharp image formed by the Imagon. The soft image is overlaid on top the sharp image. This is the way the lens is designed to work. This cammed lens works beautifully with a Technika. It is best to be able to work fast when photographing people and this allows you to do that. If you want to look at the image on the ground glass you can do that. If you want to be able to mount the lens on another camera as well, I have extra flanges for 200mm imagons. You will find those flanges listed on my VIEW CAMERA LENS ACCESSORIES web page. This lens is now packaged with a Master Technika VI outfit on my VIEW CAMERAS web page. 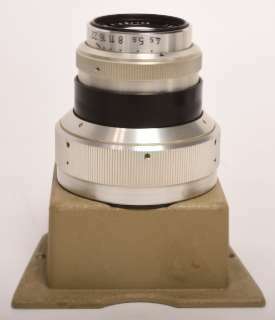 210mm F4.5 Xenar, coated, barrel with diaphragm. Beautiful glass. Chrome plated brass barrel. Many bladed diaphragm. $180. 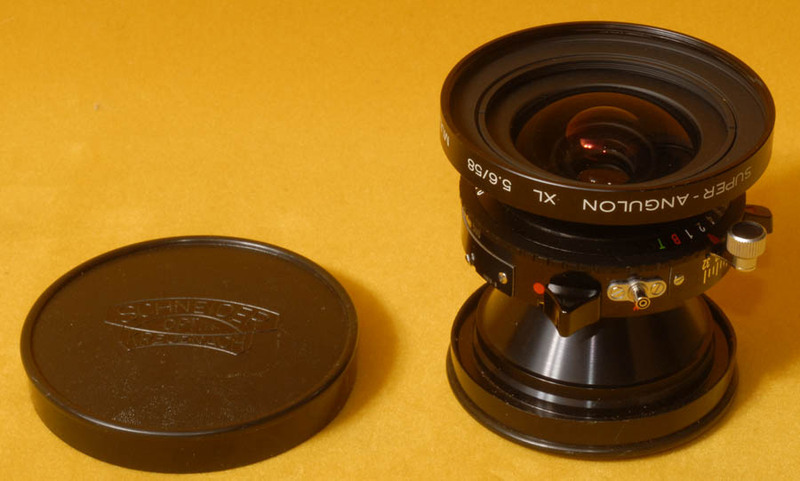 This came in with an 180mm Xenar lens and a Beattie Portronic camera. I have parts for this camera on my VIEW CAMERAS web page. Those parts are at no charge if purchased along with both Xenars. 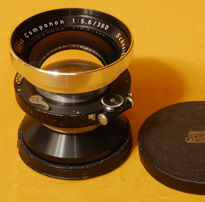 Lens shade for 210mm F9 Computar. 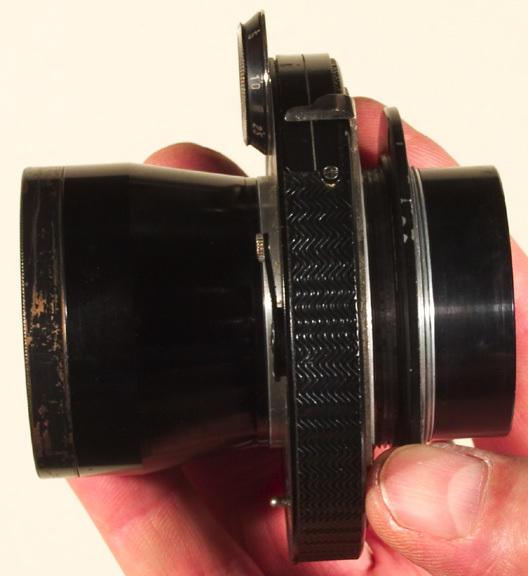 A most unusual lens shade; note the threads inside and out. This lens shade fits several Computar lenses of various focal lengths from 150mm up to 360mm. 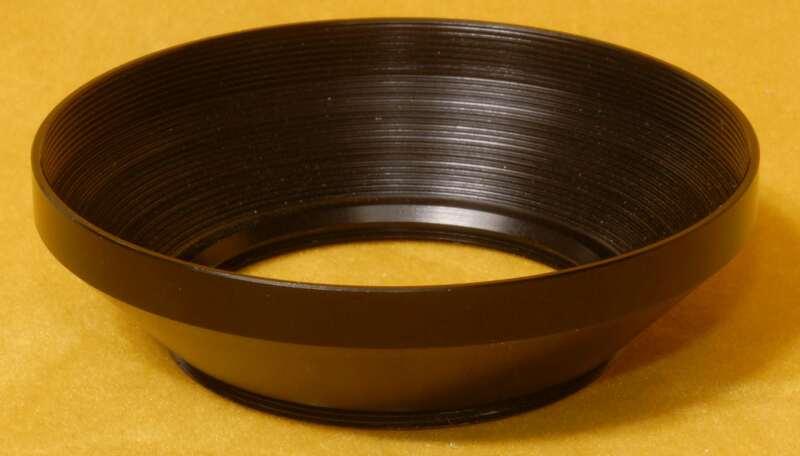 Outside diameter threads are 49mm. $60. 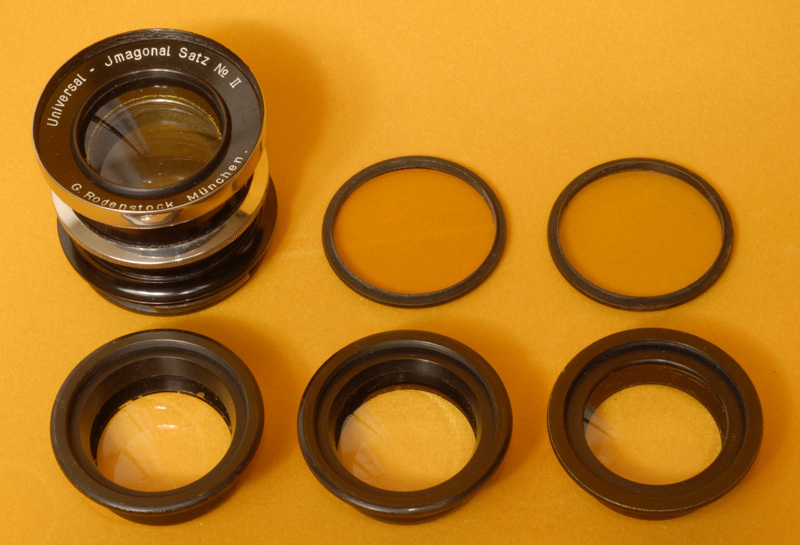 240mm F6.8 IMAGONAL SATZ II or Imagonal lens set 2. Uncoated, barrel mount with diaphrapm. Front element screws into barrel. Rear elements bayonet into barrel. You may use any of the rear elements in combination with the front element or by themselves. The front element may be used by itself. 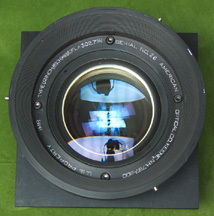 The focal lengths are: 175, 200, 240, 300, 330, 360, 420 and 650mm. The name "imagon" is associated with the more modern soft focus imagon. I do not know if this is a soft focus lens; I would guess not. My best guess is that it is more like a Dagor type double anastigmat lens. The lens barrel itself bayonets into the lens flange. 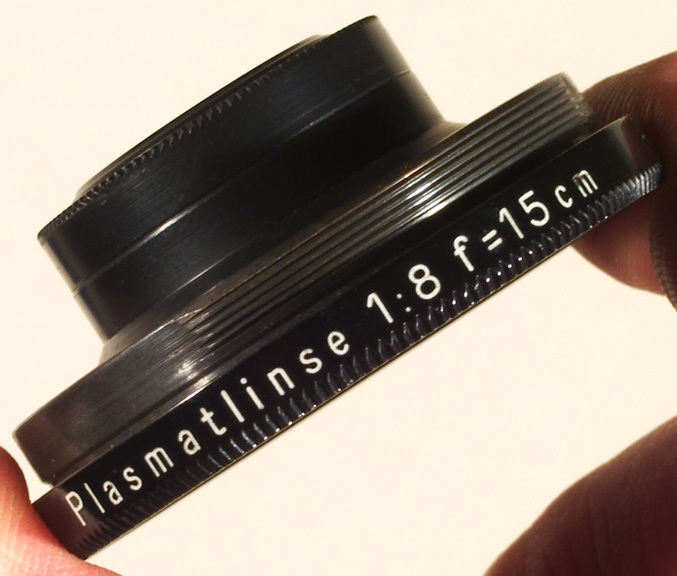 There is no lens flange. I will make a flange for the lens when I find the time or the need. The lens glass is very clean. There is no separation. There are no scratches. There is some paint coming off of the lens edges. There are 2 somewhat faded light to medium yellow filters. The lens, the filter rings and screw on front ID ring are not dented. 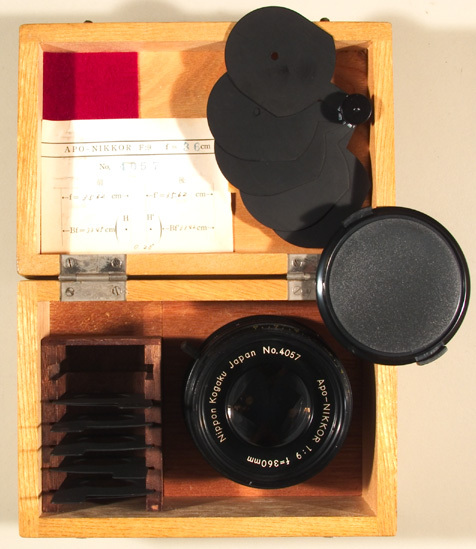 It is in the original lens case with the original information sheet. 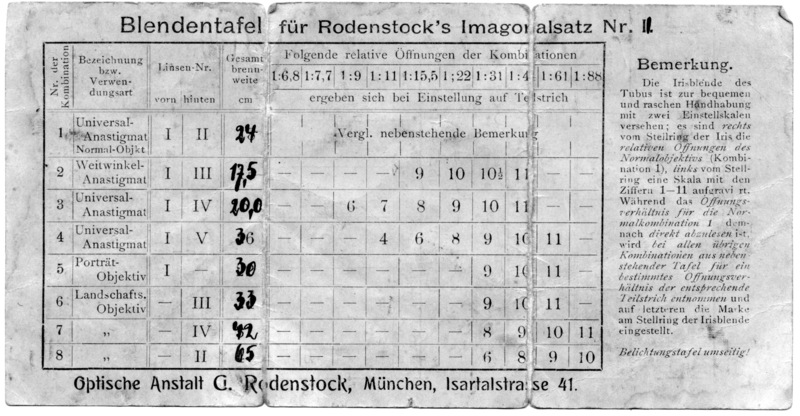 The information sheet for the II was not yet ready, so the information sheet for the Imagonal set I was used and portions overwritten. RARE! $500 as is or $800 with a custom made flange. 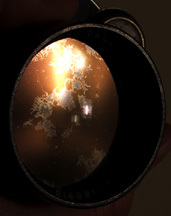 This lens is quite usable in addition to being collectable. it is even possible to mount it into a #3 shutter. 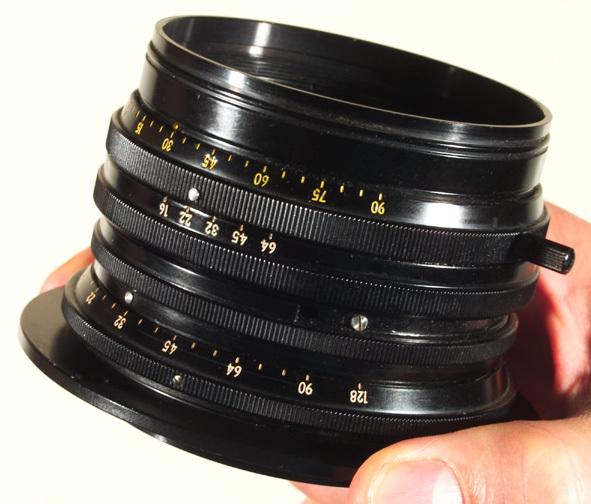 All focal lengths will cover 4X5 and 5X7; 240mm and longer focal lengths will cover 8X10. Longer focal lengths will cover even larger formats. 250mm F5.6 Graflex Tele-Optar, coated, fits either the 2X3 or 3X4 Graflex cameras, Mint, $300, Mint-, $150 Add $65 for lensboard with flange for 3X4 Graflex. Screws right into 2X3 Graflex front standard. 270mm f5.6 Rodenstock Rotelar telephoto, coated, Graphic Synchro Compur #1. Mint-. 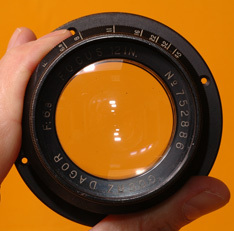 This lens is of a telephoto design, which means that the focal distance is much less than the focal length. 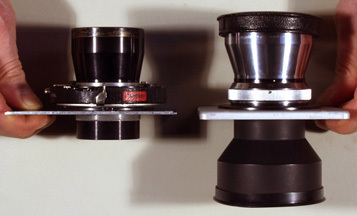 For that reason it is about the longest lens that can reasonably be used on a 4X5 Linhof Technika. For that reason, I am reserving a cam for a Linhof Technika IV/V/VI for the buyer of this lens. 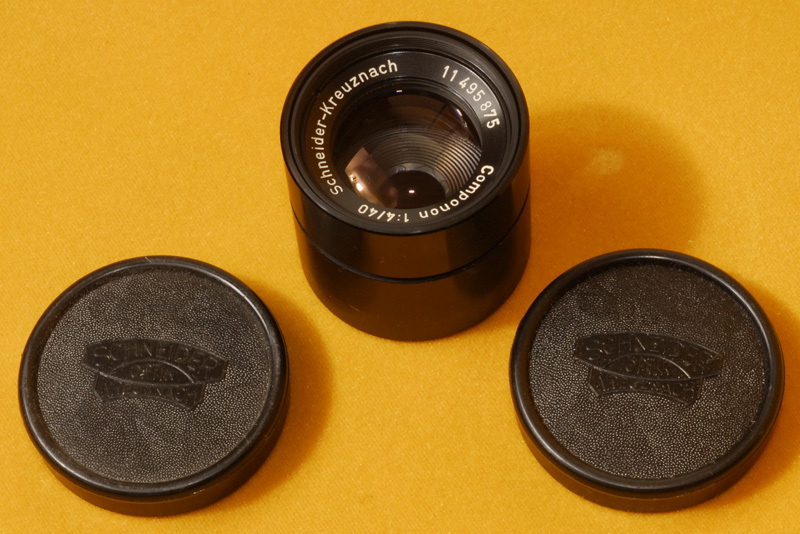 This lens is now packaged with a Master Technika VI outfit on my VIEW CAMERAS web page. 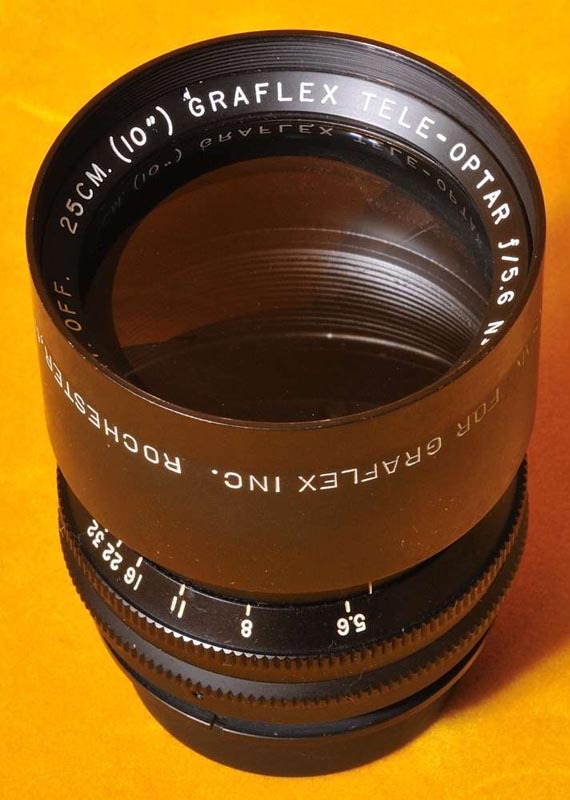 ~292mm (11 1/2") F4 Wollensak Verito diffused focus lens accessories only. 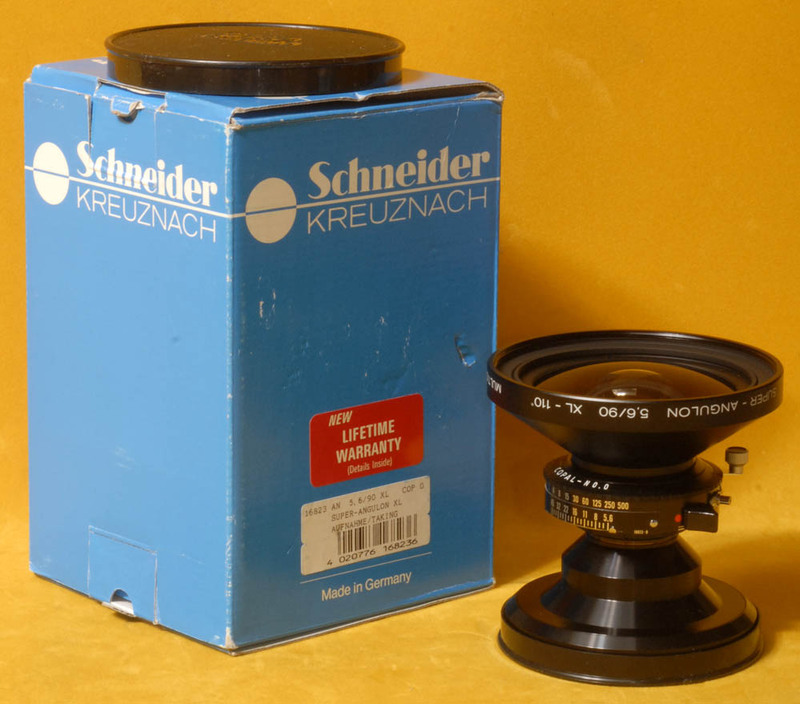 The lens was sold in a barrel. 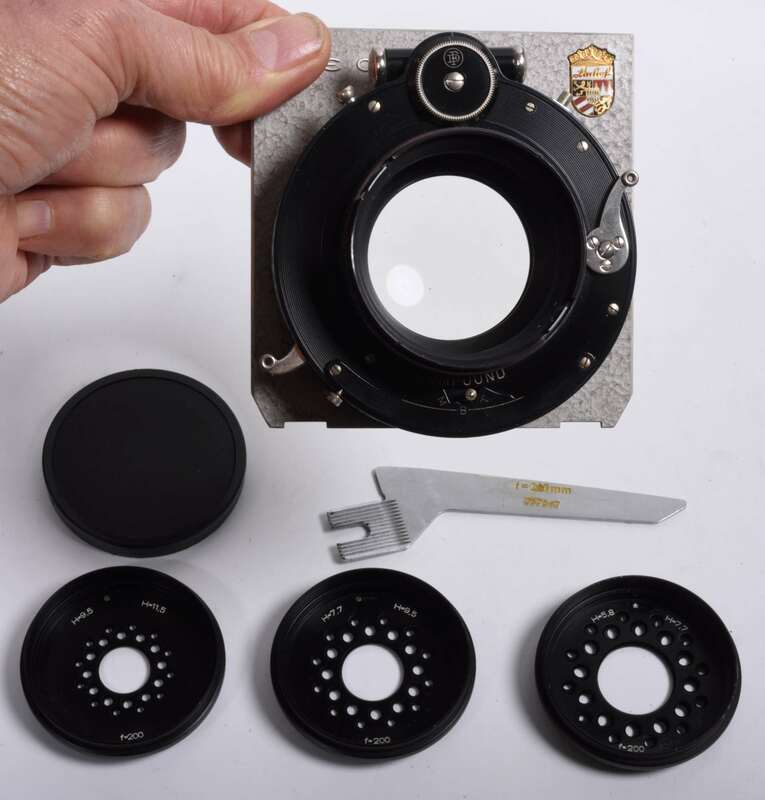 Still available is all else--including a flange for the lens, the shutter, the Verito to shutter adapter, series 9 lens shade, filters, Deardorff lens board. 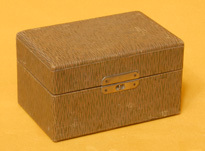 These items are listed in detail on other pages. The shutter, the lens adapter and the flange are listed on my VIEW CAMERA LENS ACCESSORIES web page. 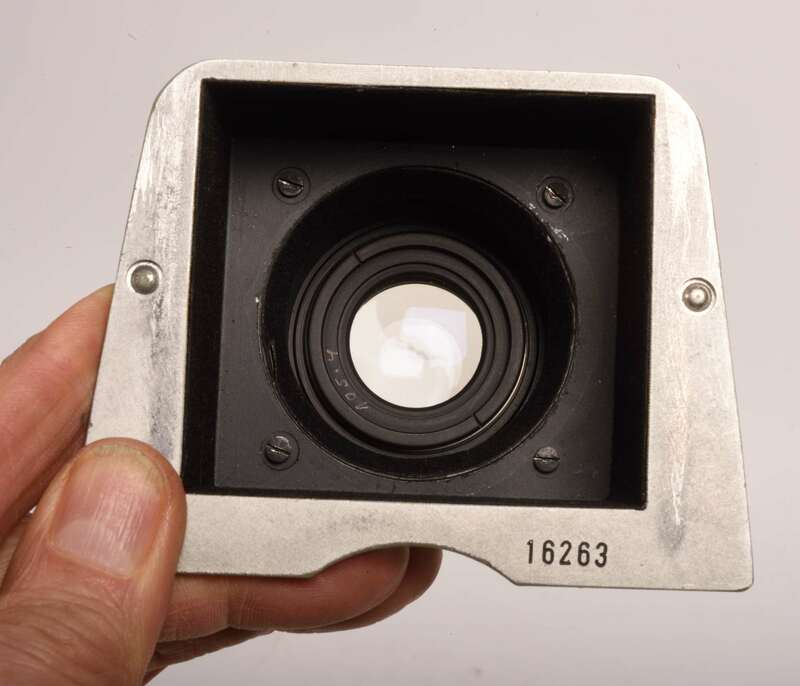 The lens board is listed on my VIEW CAMERAS web page. 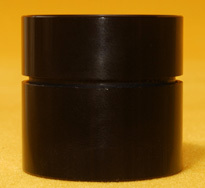 The filters, lens shade and filter retainers are listed on my FILTERS, LENS SHADES, ADAPTERS, etc. web page. 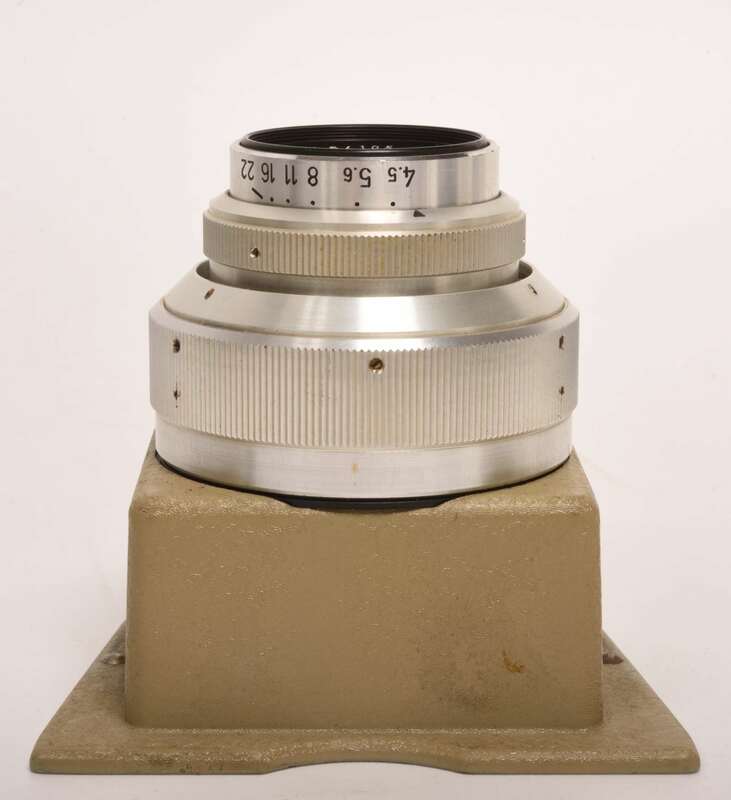 300mm f5.6 Symmar-S, coated, Copal #3 shutter, Mint-, $500. For those looking for a #3 shutter to fit a lens that is too big for an ordinary Copal #3 shutter, this has 3mm larger diameter threads than either a standard Copal #3 or #3S shutter. 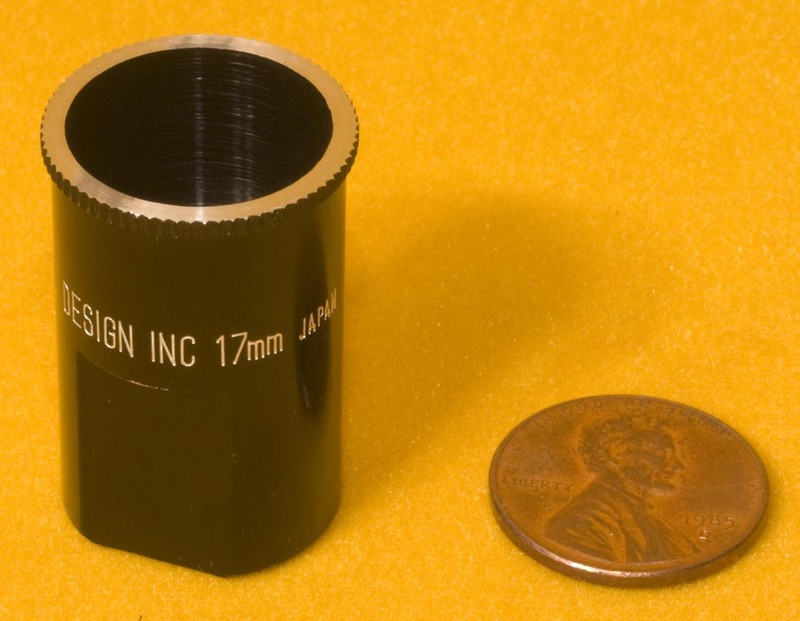 The thread size is 58mm X .75mmp. 305mm F5.6 American Optical Co. 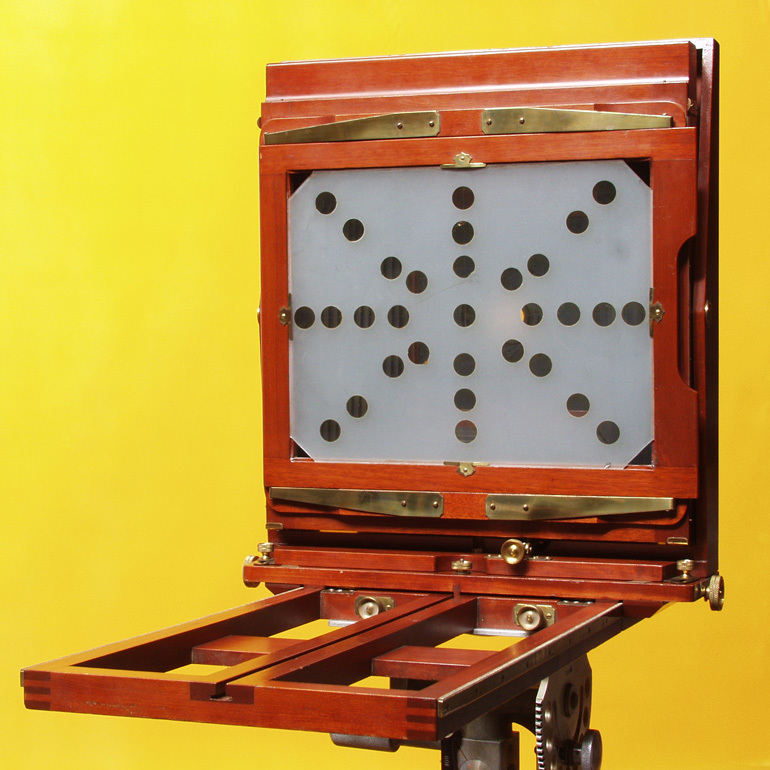 Type 1, coated, complete with yellow and red center filters, front and rear lenscaps, very wide angle, looks like a Hypergon w/o the fan, but it has more elements and is a higher quality lens, covers 12X20 with movements! Designed as a high resolution mapping and spy lens for use in planes like the U2, it is sharp and rectilinear, but decidedly soft focus @ F5.6. It's a true soft focus, too, similar to the Kodak Portrait lens in performance with spherical abberation the source of the softness which means that the abberation is at the lens' periphery. It gradually, but rather quickly becomes sharp as you stop down. At f8, 3/4 of the soft focus effect is gone. At F11, almost all of the soft focus effect is gone. The center filters in that huge size would cost about $2000 each today. 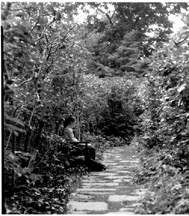 Center filters help even out the exposure on extreme wide angle lenses, however I have not noticed any light falloff in the 8X20 format w/o the center filters. Lens in barrel with water house stop set from F5.6 to F90, + 2 soft focus stop sets (similar to Imagon stop sets), + 4 blank stops, with manual slide shutter. This lens in this configuration has been sold, but I can build another, New-old-stock, $1800, filters slightly less than mint. Also available in barrel with F45 fixed aperture mounted on Sinar lensboard @ $1200--illustrated following the filters. 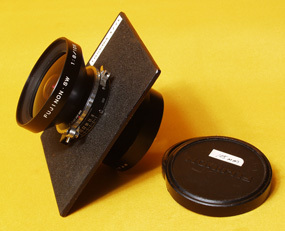 Will custom mount to lensboard for your camera. Due to the design of the lens, it is not possible to mount the lens into a modern shutter. 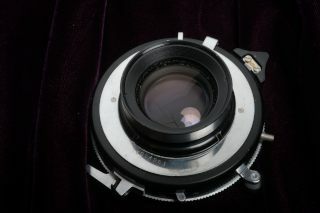 I was able to mount the lens on either side of a Sinar shutter for one customer. 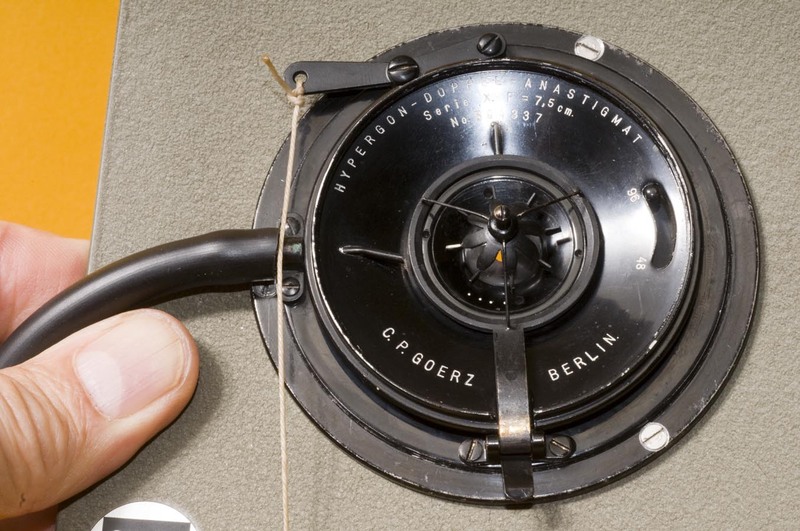 Also due to the design, it is virtually necessary to incorporate the lensboard into the barrel as illustrated. 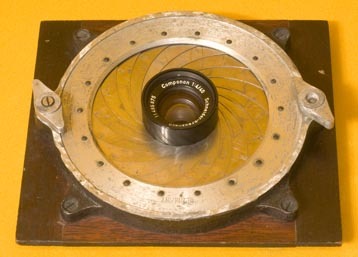 305mm F9 Computar lens to cover 12X20". It will cover 12X20" with a little room for movement. This is the only such lens of this focal length I have had. It took me years to find one. The lens is a fairly modern factory coated lens in a #3 Copal shutter. It is a small lens. It is a great lens and anyone who buys it for 12X20 or smaller format usage will de delighted with it. This is the same lens formula as the 210mm Computar in a different focal length. This is my 1st choice in this focal length. RARE. $OLD. 305mm F9 Carl Meyer Apo-Process lens, coated, Synchro Alphax shutter, numerous scratches on glass, but a great performer nevertheless, covers 11X14", outperforms most other 12" lenses by my experience, from my personal user inventory, $400. 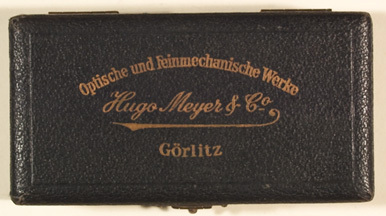 Carl Meyer is one of Burke and James' house brands. Burke and James did not actually manufacture lenses. 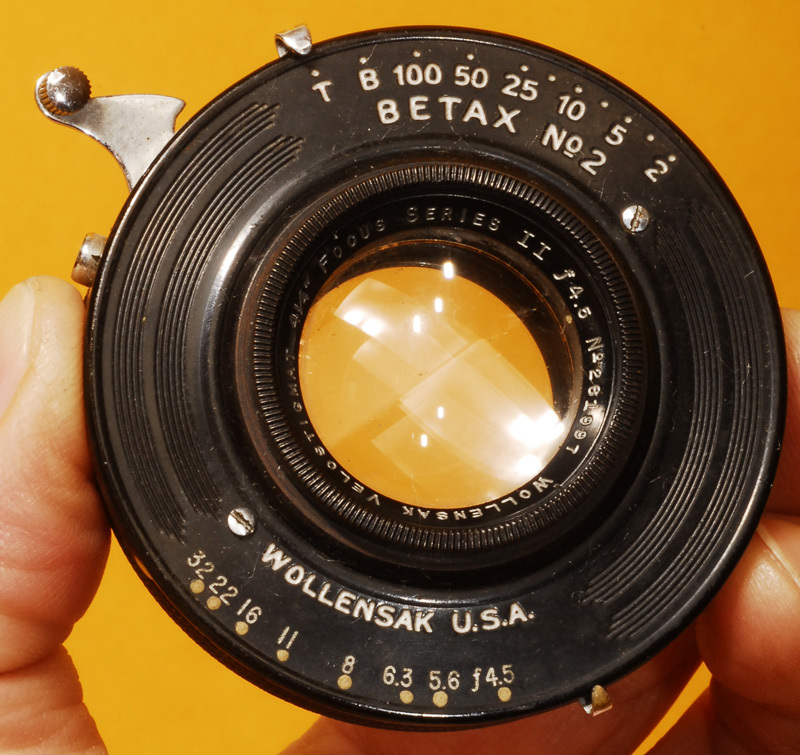 Instead, Burke and James remanufactured other manufacturer's lenses. 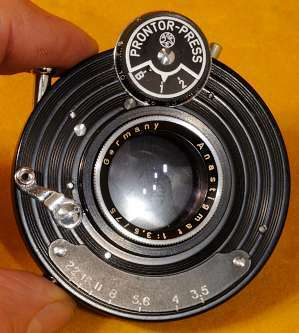 This lens was originally an Apo-Process lens made most likely by Goerz. The serial numbering system is Kodak's which means that this lens was remanufactured by Burke and James in 1969. Comes with 2 metal lenscaps. 360mm F5.6 Durst Componon, coated, synchro Compound, felt lined leather lens caps, Ex, $400. 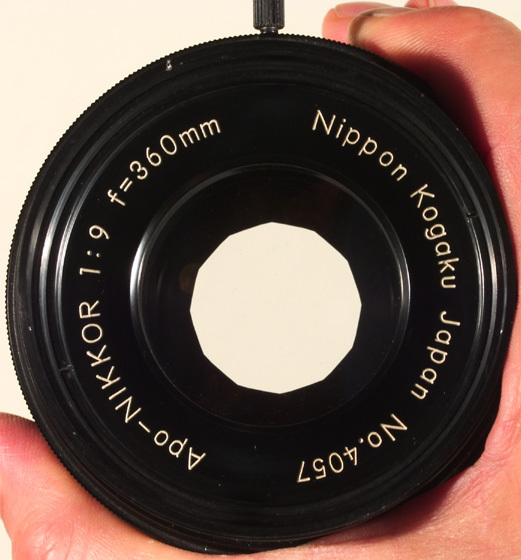 You may want this lens for the large shutter. 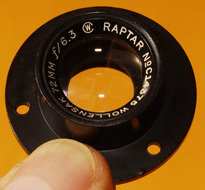 The lens threads front and rear are 67X.6mmp front and rear. These lens caps are special too and hard to find in these sizes to fit 100 and 110mm OD lenses. Do not discount the Componon lens, however. Componon lenses are optimized for 10:1 reproduction ratio. Most commercial view camera lenses are optimized for 1:10 reproduction ratios. Those are the same when you consider the direction of lens orientation. The difference is that the Componon is better color color corrected and it is flat field. 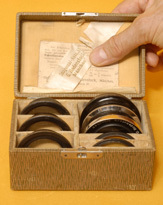 Knowledgable commercial shooters know this and order the Componon in a shutter. I also have a 360mm Componon in special lens mount with 3 point alignment system listed on my Other Enlargers and Enlarging Lenses web page and on my Durst Enlargers web page. 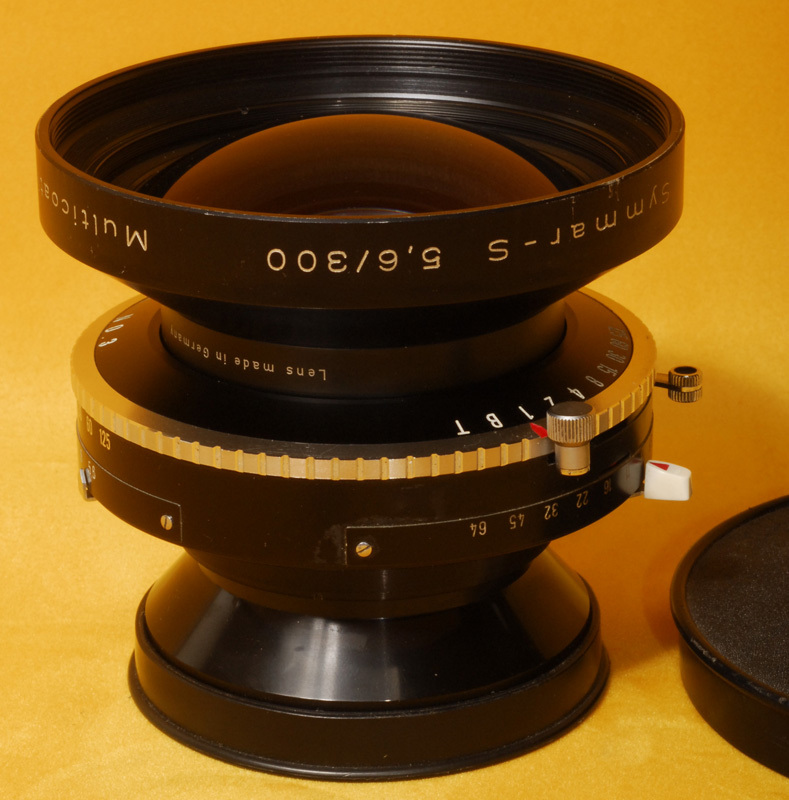 360mm F9 Apo Nikkor, coated, barrel, lens has filter slot that accepts gel filter holders, includes several gel filter holders, customizable stop set, round diaphragm, and square diaphragm, boxed, except for a couple of slight cleaning wisps, Mint-, $450. Not only do you have a square diaphragm in addition to the round diaphragm, but you may rotate that square diaphragms with a calibrated rotation scale. 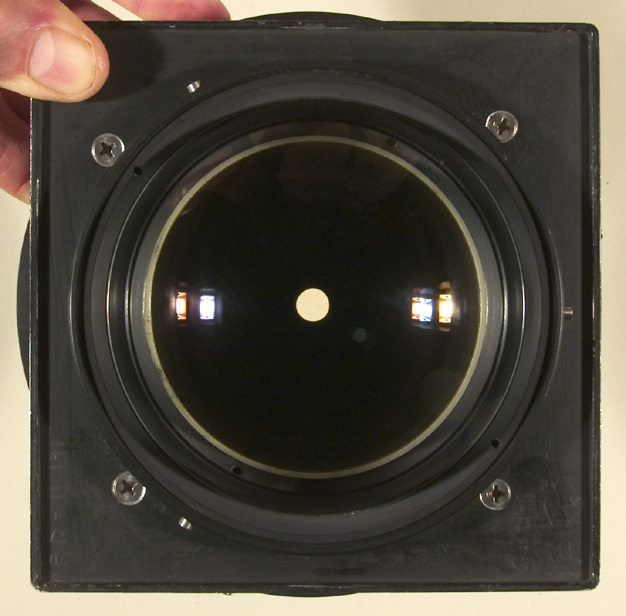 From rear of lens: round diaphragm scale calibrated in 1/3 F-stops, filter slot rotating cover, square diaphragm scale, square diaphragm rotating scale calibrated in 5 degree increments. The advantages of the rotating square diaphragm: 1) elimination of image degrading non image forming light, 2)	formation of square or, if rotated, diamond shaped dots in your printing plate. In some situations in ordinary photography where you may see the shape of the diaphragm in the form of flare--you could have a square or diamond shaped flare artifact instead. The blank stops may be cut to any shape diaphragm opening you want. 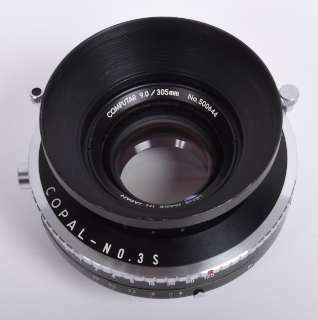 360mm f9 Graphic Kowa, coated, Copal #3s, with lensshade, very wide coverage and very sharp, if you want prestige--buy a Gold Dot Dagor, if you want a lens that will perform as well--buy this lens. These lenses are convertible and may be used in combination with other focal lengths from other Grafic Kowa lenses to provide intermediate focal lengths. Consider buying this lens in shutter and one of the 305mm Grafic Kowa lenses listed above in barrel and using the lenses convertibly in the same shutter. The combination of one element from the 360mm lens and one element from a 305mm lens yields a 330mm focal length. A 240mm F9 Grafic Kowa lens will also screw directly into a #3s Copal and work convertibly with the 305 and 360mm Grafic Kowa lenses. NEW-IN-BOX, $1300. 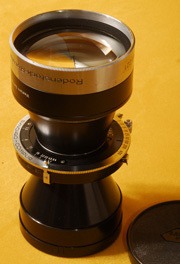 480mm F9 Rodenstock Apo Ronar CL, coated, barrel, stops down to F90, also with millimeter scale, auto closing filter slot, with lens shade and front leather lens cap for shade, with rear lens cap. The Apo Ronar CL is Rodenstock's best Apochromatic lens. The Apo Ronar CL is recommended for map making and other situations that call for higher resolution. Mint, $400. This came in without a flange. 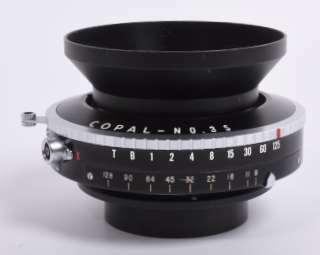 So I can supply a flange from another lens with the Apo Ronar CL for an additional $125. 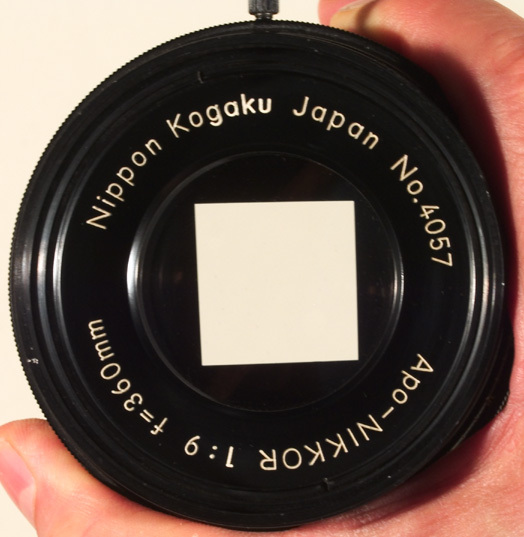 The lens shade fits perfectly in the same manner as it was designed to fit onto a 420mm or 480mm Apo Nikkor. 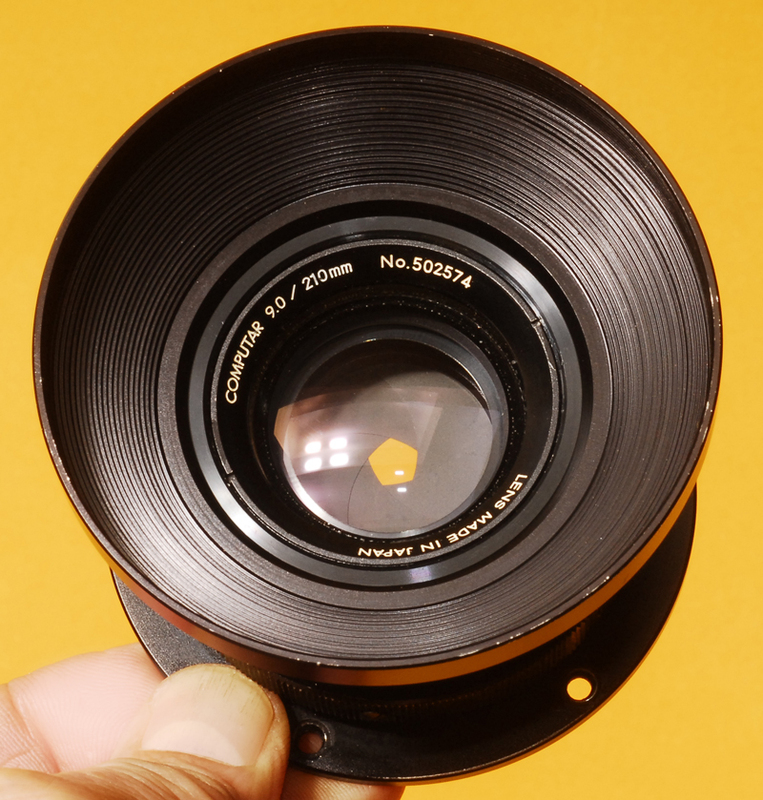 The lens shade with lens cap have been $OLD and the price of the lens was reduced. 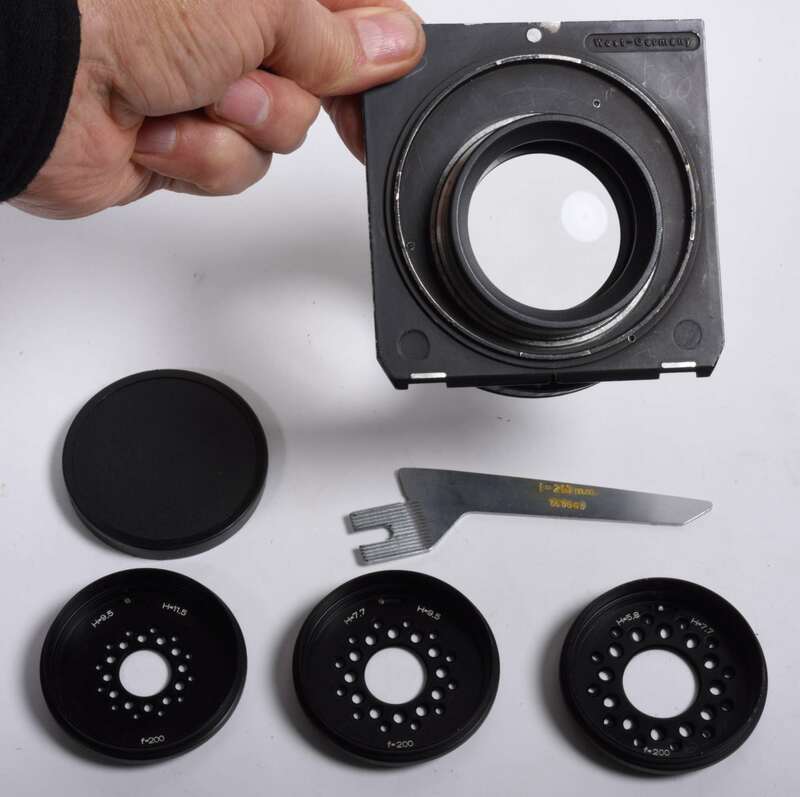 For SHUTTERS, FLANGES, AND BOOKS ABOUT LENSES click this link. 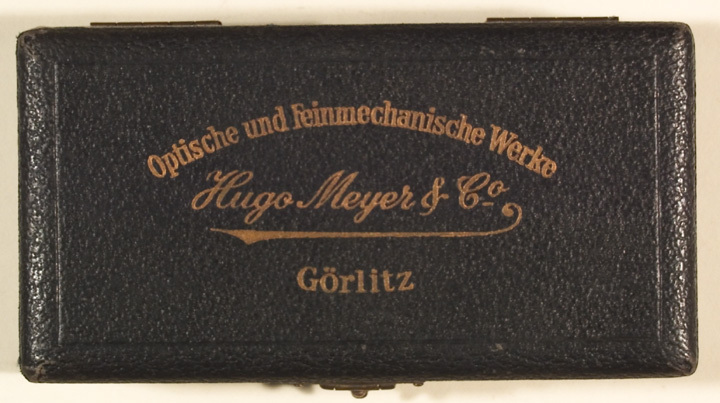 The paragraph below is copied from a 1951 C. P. Goerz American Optical Company catalog. And, quoting from a 1919 Wollensak catalog, "Air bubbles are not, as is often thought, a defect in photographic lenses. 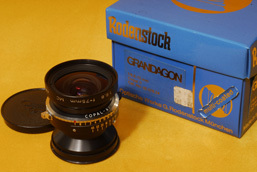 In fact, while they are more apparent in the highest type of lens, they seldom appear in the cheaper grades. Bubbles are caused by the necessity of fusing the optical glass used in making lenses of high quality at a certain temperature, whether all bubbles have risen to the surface or not, in order to maintain certain optical properties. Such bubbles absolutely do not impair the definition or lessen the efficiency of a lens in the slightest degree." How to clean your lenses. 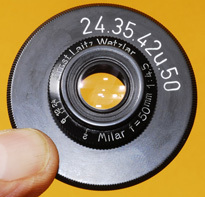 Virtually all lenses will pick up a film over time. Our atmosphere is far from pristine. 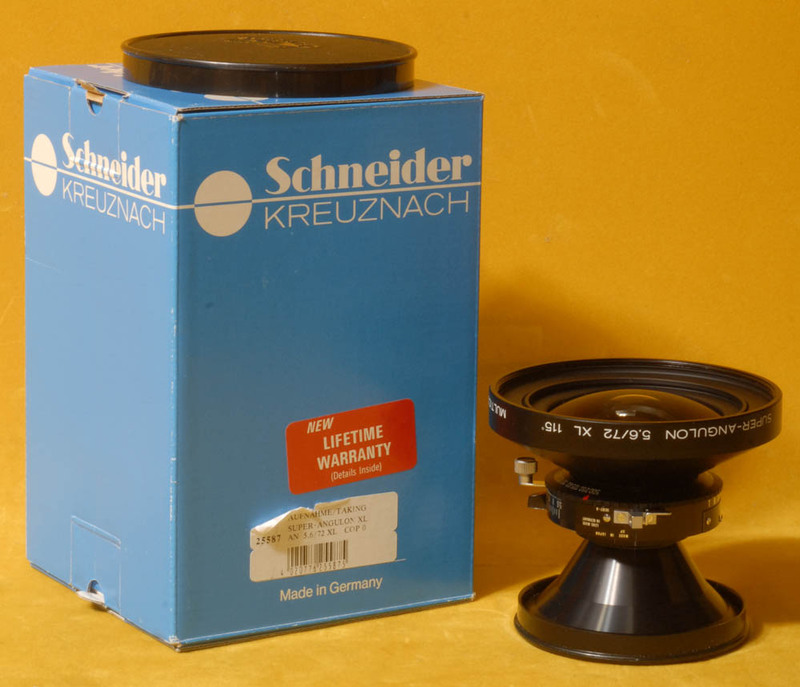 Any lens shipped via diesel trucks, jet fueled planes, etc. will likely pick up a film. It is not good to clean lenses any more than necessary. In case you do not know how to clean lenses: 1st make sure any dirt or debris that could scratch the lens is not on either the lens or the tissue. 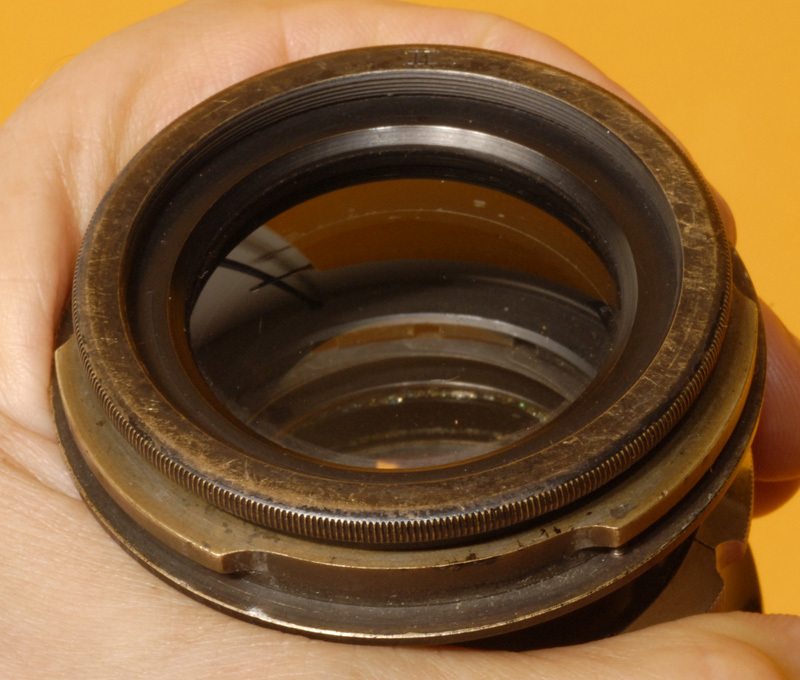 Inspect the lens surface for dirt by looking at it with light reflected off of its surface as well as through it. Do not hesitate to inspect with a magnifying lens. Put the lens cleaning fluid onto some tissue, not on the lens. If you put the cleaning fluid onto the lens or if you use excessive fluid, the fluid may work its way down around the edges of the lens and may affect the cemented layer. Start in the middle and work your way out to the edges. Rub lightly at 1st feeling for any dirt you may have missed. Do not grind dirt into the lens; you will likely scratch it. After cleaning the lens, use a 2nd piece of fresh tissue to pick up a little moisture still left on the lens and finish the job; you want a little moisture on the tissue to act as a lubricant. Denatured alcohol is a good lens cleaner if commercial photographic lens cleaning solutions are not available. Oftentimes, either will not clean some films off of lenses. I have found that one's breath does a good job of cleaning such stubborn films off of lenses and have used this technique for decades without problems. I have read that one's breath is not good for lenses according to one manufacturer of lens cleaning solution, but then that manufacturer's business is selling cleaning solution. 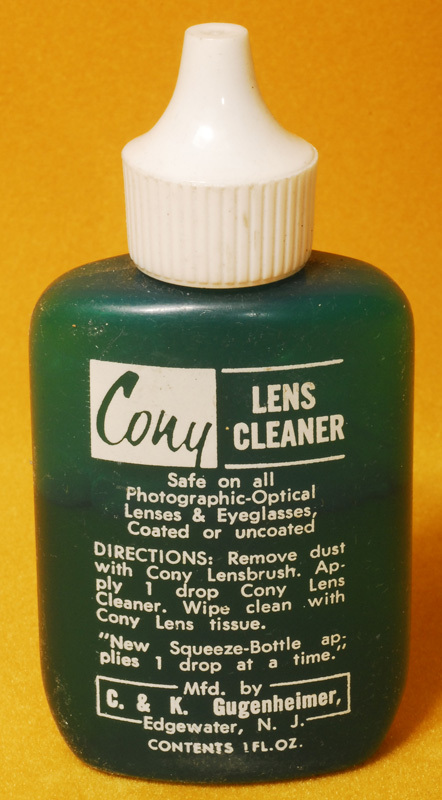 I will continue to use my breath only when lens cleaning solution does not do the job. Recently I was cleaning some tele-extenders that had some small spots on them that may have been tree sap. Neither alcohol nor my breath would remove those spots, but the lens cleaner illustrated below did. Acetone can be used as a lens cleaner for some substances, but be aware that it will soften paint and maybe some plastics, so best to use it on a Q-tip only to remove stubborn spots on the lens surface away from the barrel. Do not use your shirt or whatever is available to clean your lenses. Use only high quality lens cleaning tissue. Kodak is a good brand if still available. I use some vintage tissue from the American Optical Company. Center filters may have something like a silver coating on them which may scratch and/or oxidize easily. 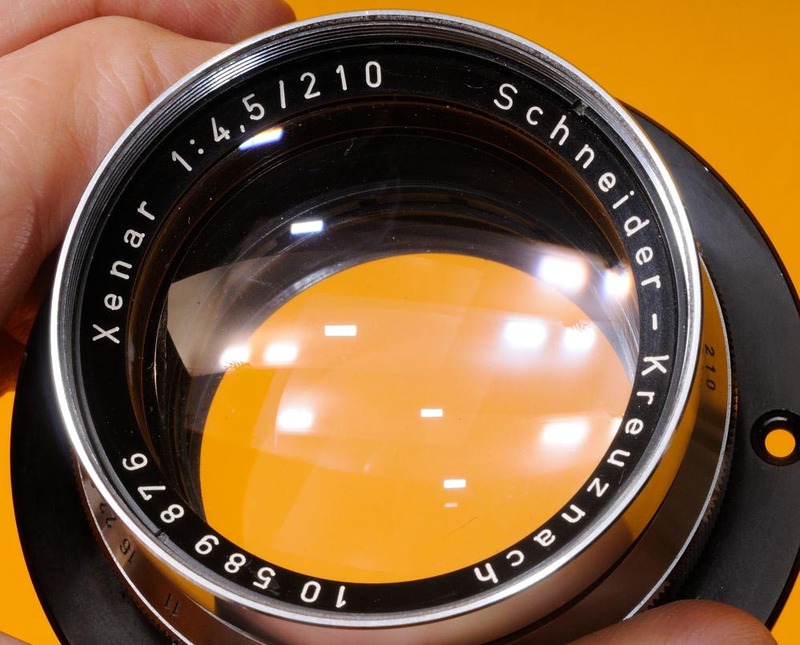 Be especially careful with older lenses. 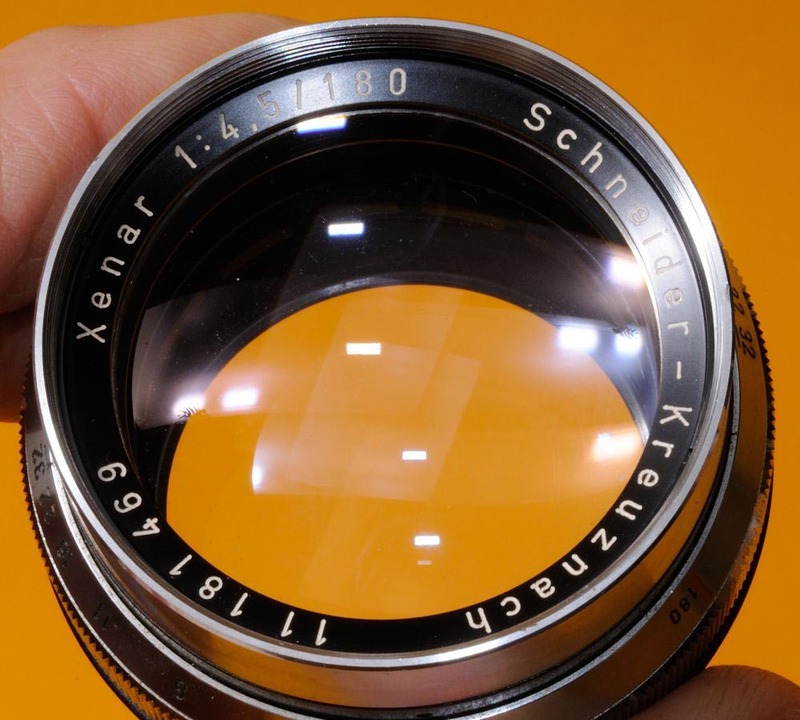 Some very old lenses are quite resistant to scratches; other older lenses are particularly prone to being scratched, a prime example being Kodak Commercial Ektar lenses and other lenses of about the same vintage. That is why you will rarely find a perfect Commercial Ektar. I am suspect of some lenses that do not have scratches because they may have been reworked. I had a particularly bad experience with Pacific Optical Company, who made some lenses look beautiful, but the lenses no longer performed well. Virtually no one is competent to rework lenses today. I would prefer a factory original lens with scratches to a reworked lens any day. Only the original factories had the skilled workers with the specifications, the knowledge, the experience and the equipment to do the job correctly. In the past there were some remanufacturing facilities that did a competent job. Burke & James was one. 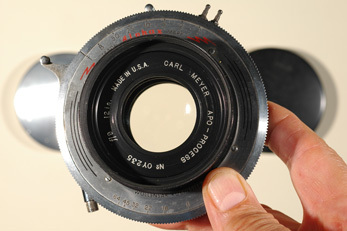 When B&J reworked a lens, they changed the lens' name to Carl Meyer or Karl Meyer. You have to guess what the lens originally was by other clues. 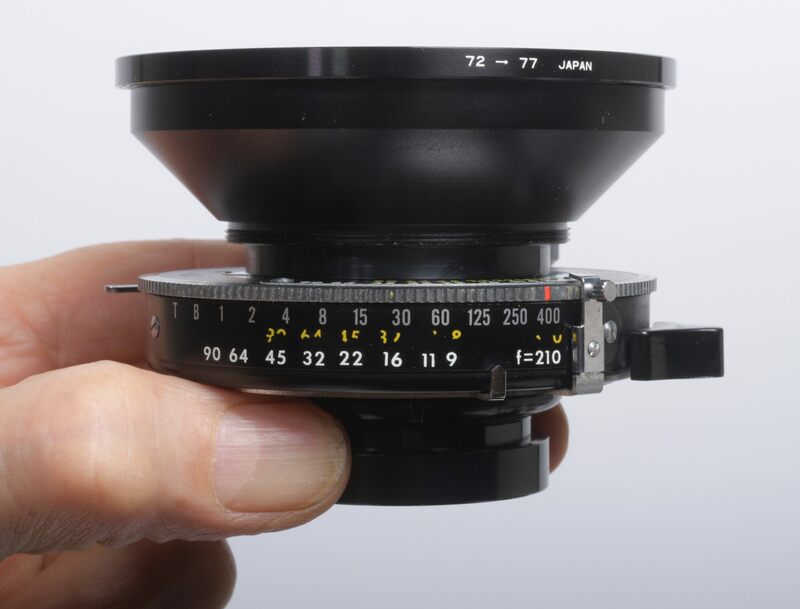 I have a couple of 12" lenses reworked by B&J on this list. They have both been tested and perform exceptionally well and are reasonably priced. Just as American Optical Company said about air bubbles, "......the presence of a few air bubbles does not in any way affect the work of the lens. Their presense is rather a guarantee of quality than otherwise." .....scratches may also be an indication of original factory quality.